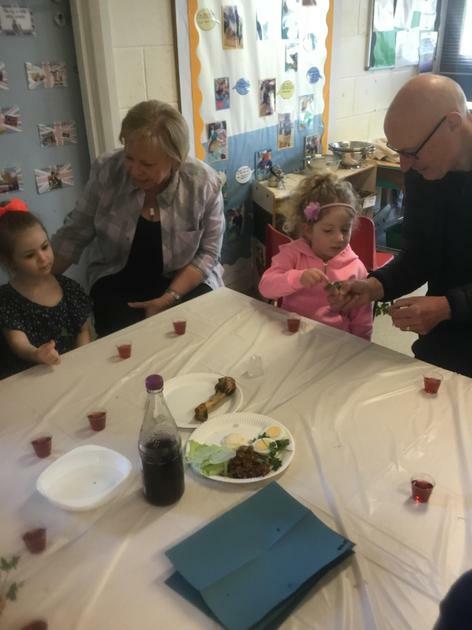 Nursery have enjoyed learning about Pesach this week. 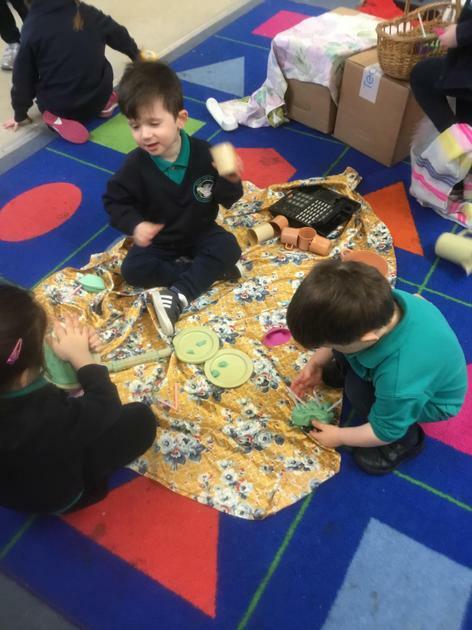 They learnt different songs and practiced for their Seder in the role play area. 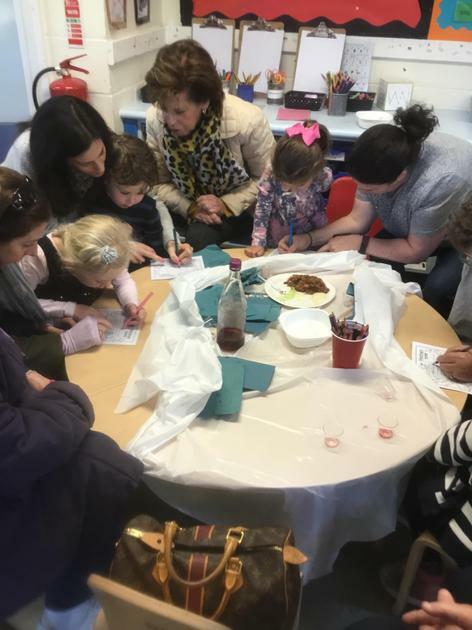 Thank you to those who came to the mock Seder it was such a lovely atmosphere. The children enjoyed sharing their learning with you and singing songs together. 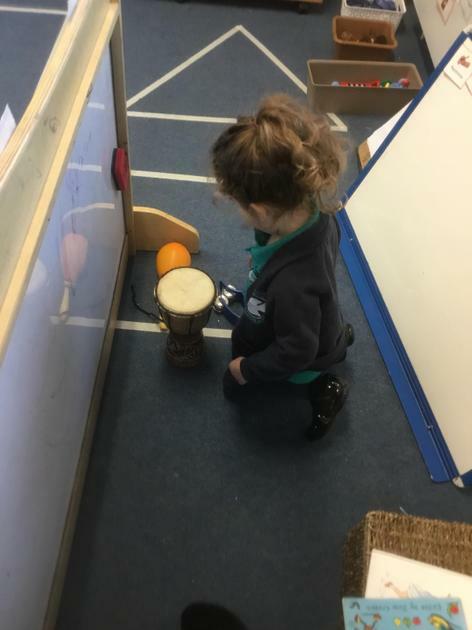 The Nursery favourite was searching for the Afikoman in the classroom! 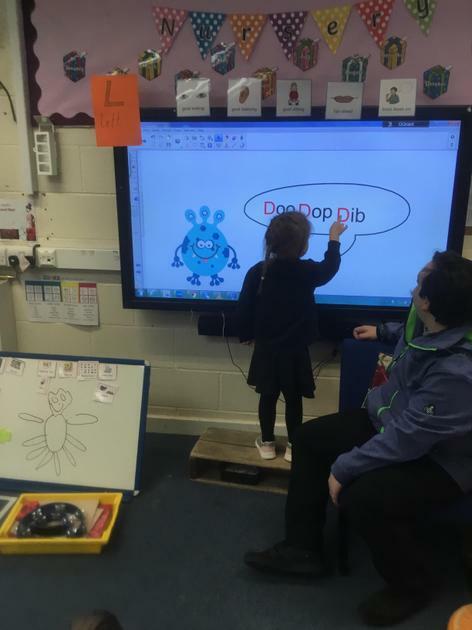 This week the children enjoyed using the interactive whiteboard for their learning. We continued practicing separating groups of objects and being able to recognise that the total is still the same. 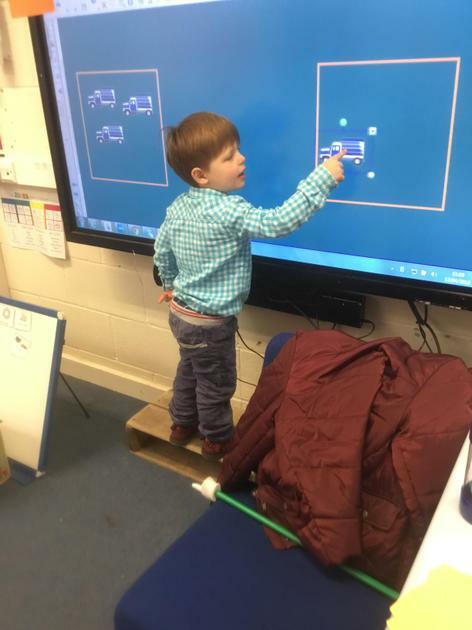 Nursery are brilliant at this and were excited to show their understanding. We made alliteration aliens using playdough. Some children were able to make up names for their aliens starting with the same sound. 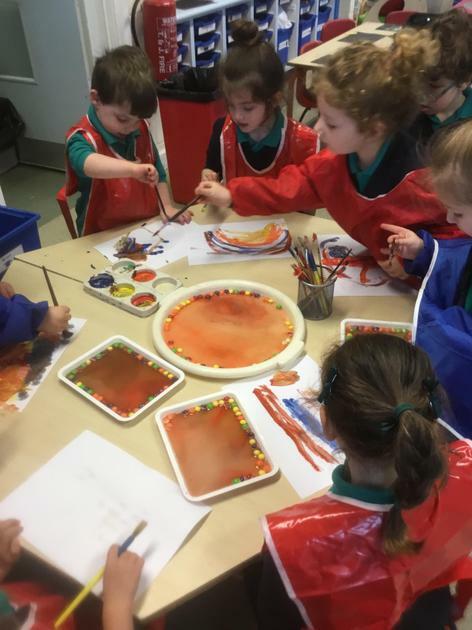 Another exciting week for Nursery! The children have been really interested in performing and making up shows. This week the children had the opportunity to learn about the theatre and being a real performer. 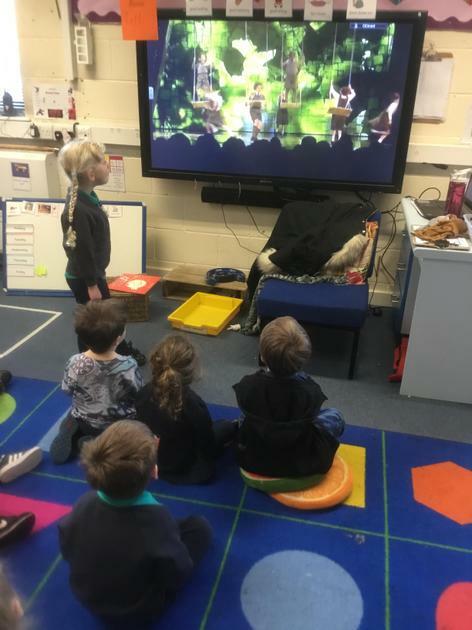 We watched clips from Matilda the musical and learnt the song 'When I Grow Up'. The children watched a tour of a real theatre from the cast of Matilda! They used the role play area to create their own shows and sing the songs from the show. There was lots of opportunity for mark making, including making posters and tickets for the performances. 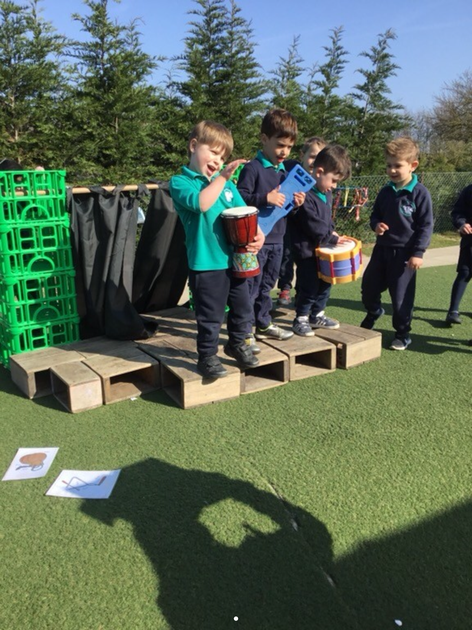 Lots of children enjoyed building stages outside and performing on the mount. In phonics, the children re-capped Instrumental Sounds. 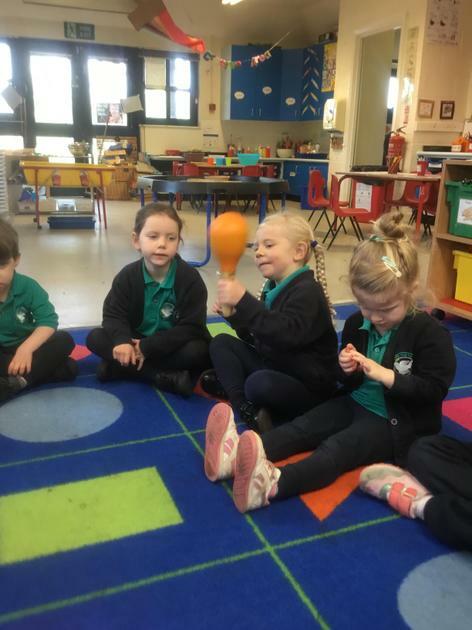 As a class we played and listened to different percussion instruments and used our listening ears to guess the instrument. Our Maths input focussed on seperating a group of objects and understanding that the total amount stays the same. This concept was taught through buying theatre tickets and treats for the show. The children explored this Maths concept independently in the role play area. 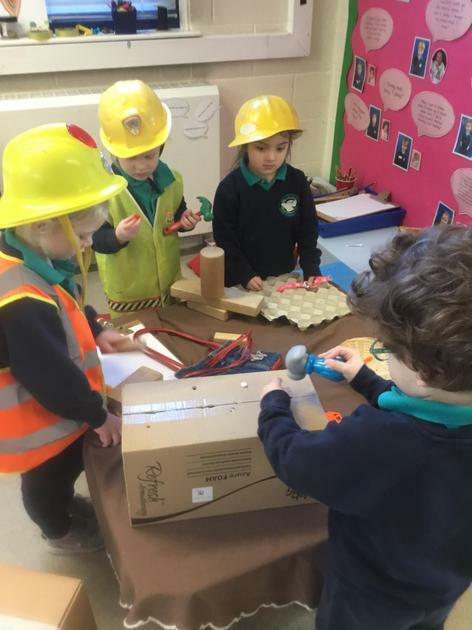 Nursery have explored a range of new ideas in the in indoor and outdoor environment. Outdoors they have been engaged in our topic 'Under the Sea'. 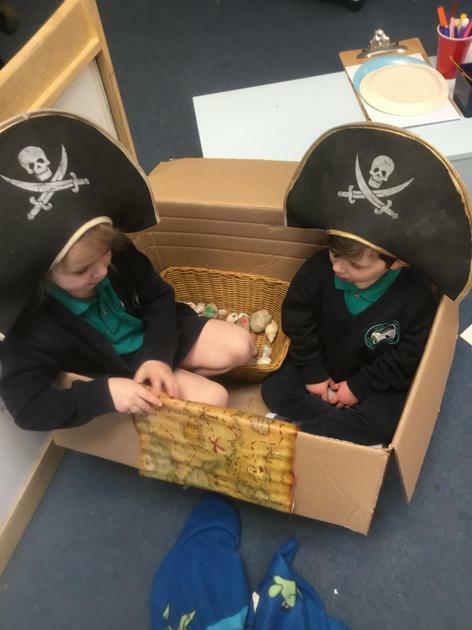 Some children created their own underwater world using materials and crates. 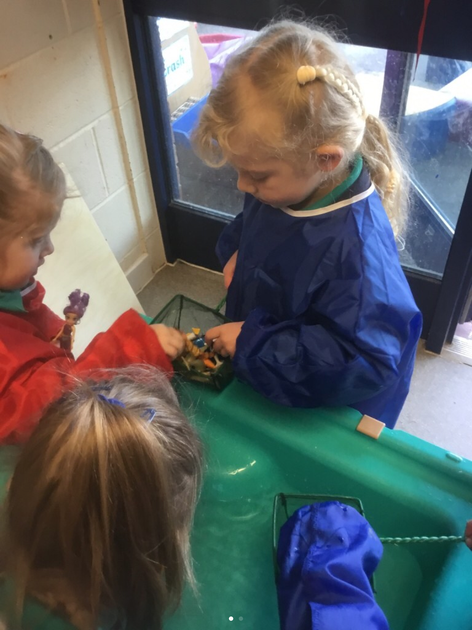 Other children discovered sea creatures in our water tray. 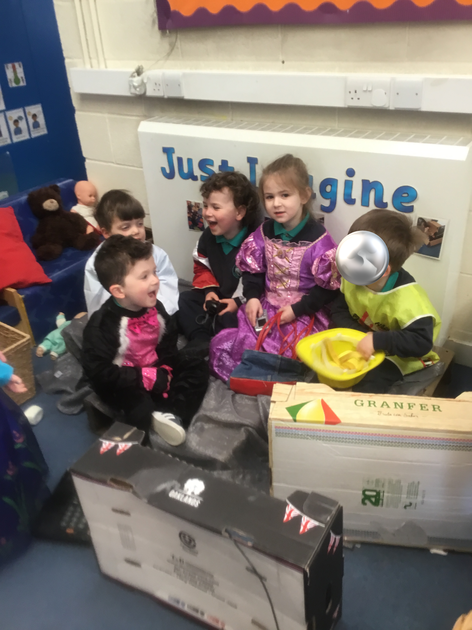 The children have been interested in performing and they worked together to set up a stage in the role play. We will be learning more about theatre and performance next week. Nursery revisited shape this week. 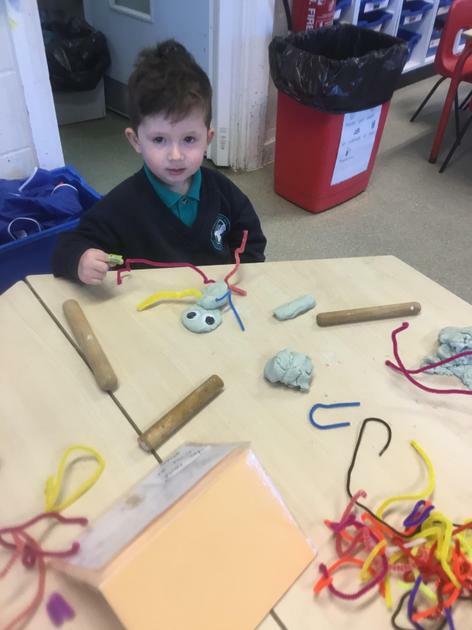 Some of the learning opportunities included: Creating their own shape picture, moulding the playdough into different shapes and using construction resources to follow shapes. 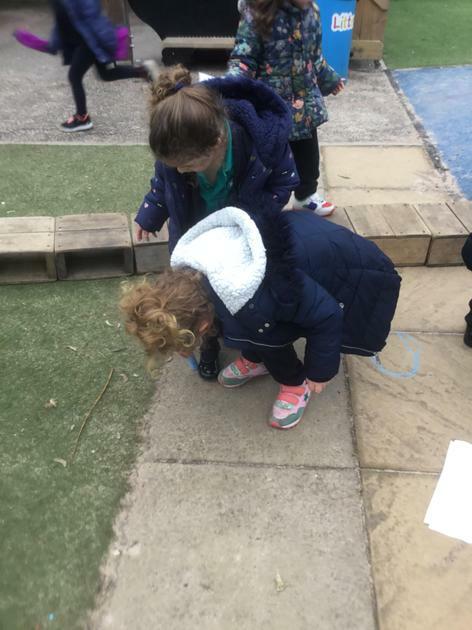 The Nursery favourite was going on a shape hunt in the indoor and outdoor environment! Finally, in Phonics the children have enjoyed learning about voice sounds through listening and attention games. It has been such an exciting and busy week for Nursery! 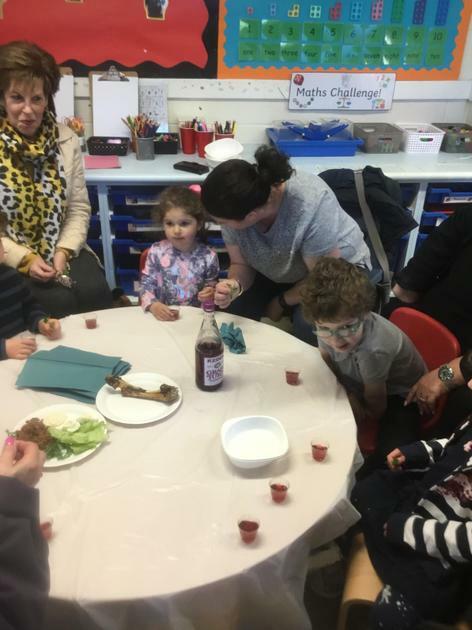 The children have celebrated Purim with their friends and tried lots of different experiments for Science week. We read the book Farther by Grahame Baker-Smith, which is about a boy who dreams of flying. 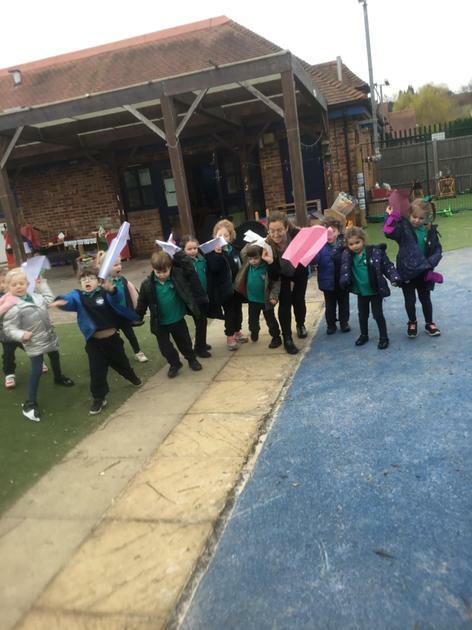 Nursery designed their own airplanes using the Lego before learning how to make paper airplanes. This was challenging but the children were able to follow instruction and with support made their own airplanes. 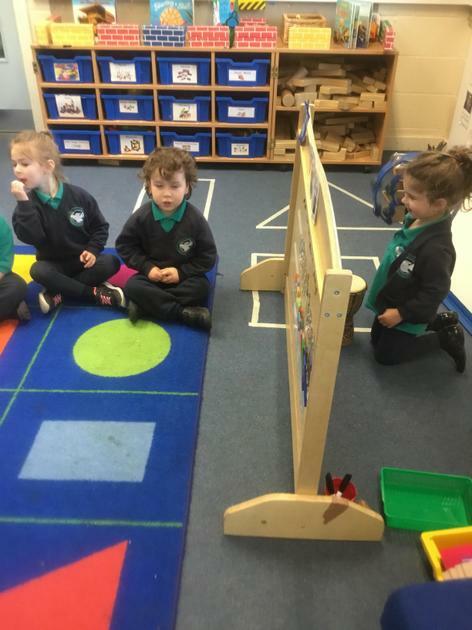 Nursery were taught about distance through counting steps. 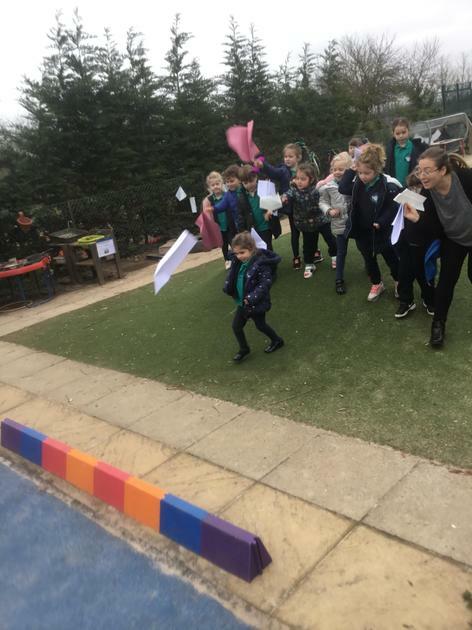 For example, the children tested how far their airplanes could fly. 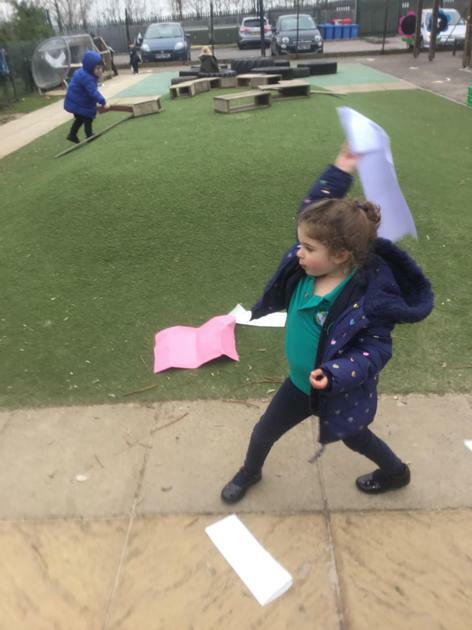 When their paper airplanes had landed they were able to count how many steps it took to reach their airplane. Some children extended this by drawing around their footprints with chalk. 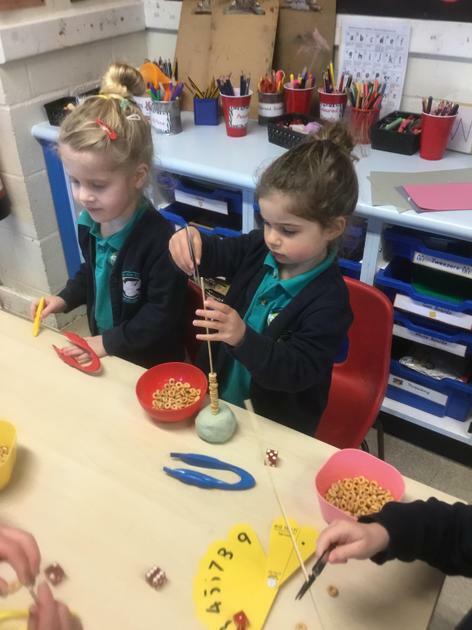 The Nursery highlights include: exploring capacity through potion making and testing magnets. The children worked together well and shared ideas. 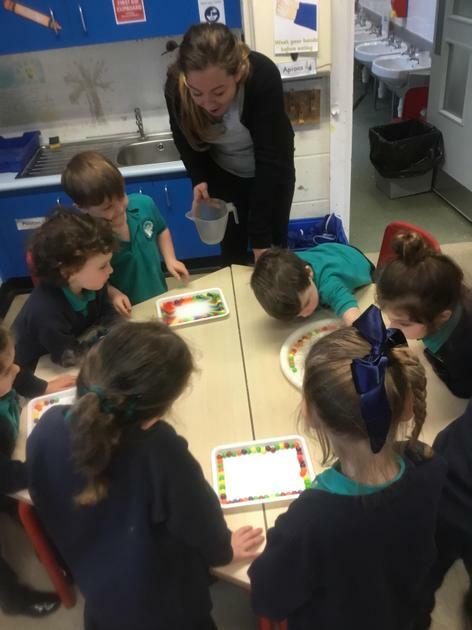 Nursery also tried the skittles experiment where water is added to a plate of skittles. They were able to describe the change and paint what they saw using different colours. 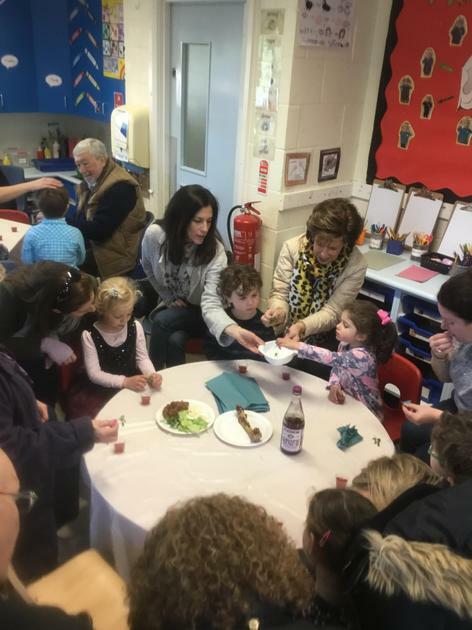 Finally, the children enjoyed the different Purim activities such as making Michloach manot. In Jewish studies they told the story of Purim using puppets. Here is a slide show of our exciting week! 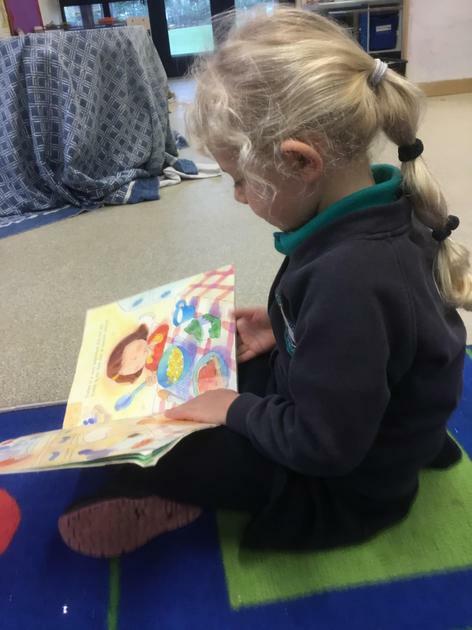 It has been another exciting week in Nursery. 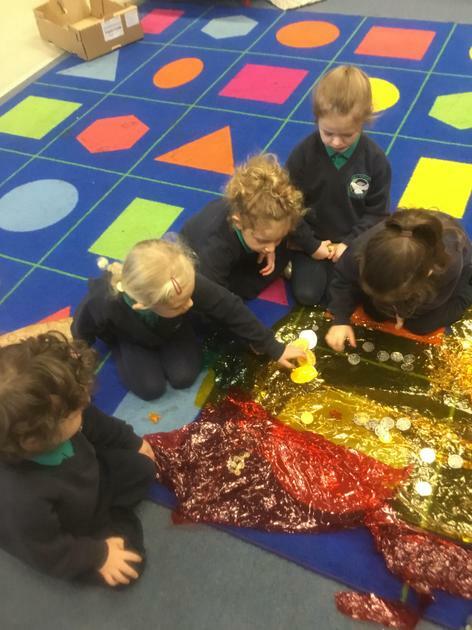 Our new topic 'Under the Sea' was introduced. Some children chose to create their own under the sea pictures using a range of different materials. Other children created small world beaches using yellow playdough and sea creatures. 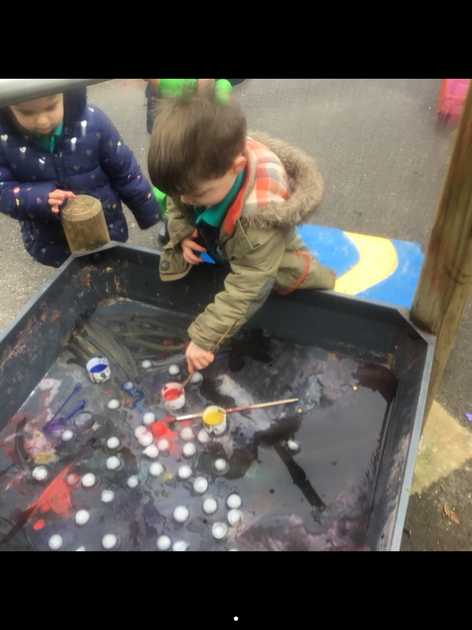 In the outdoor space, the children enjoyed testing materials to see which ones would float and which ones would sink. 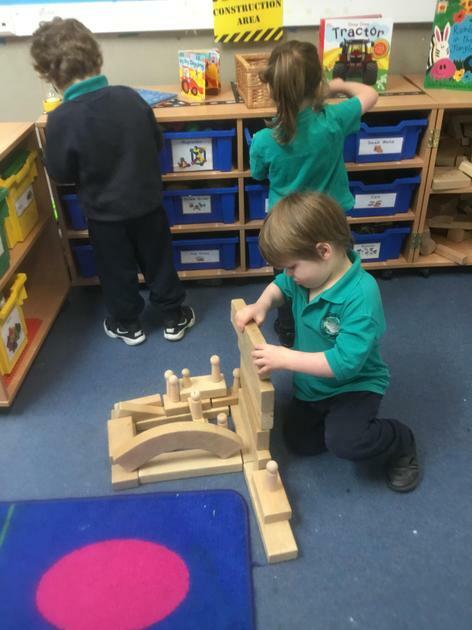 As well as use the construction blocks to build bridges and walk across the sea. In phonics we continued learning the story 'Peace at Last'. The children were able to create the different voice sounds in the story. They were also able to retell the story using boxes and open-ended resources to help them. One of the Nursery highlights this week was having a birthday party for our teddy bears! The children have been learning how to compare two groups of objects and recognise when they have the same number. The children practiced this by sharing birthday treats between the two bears. 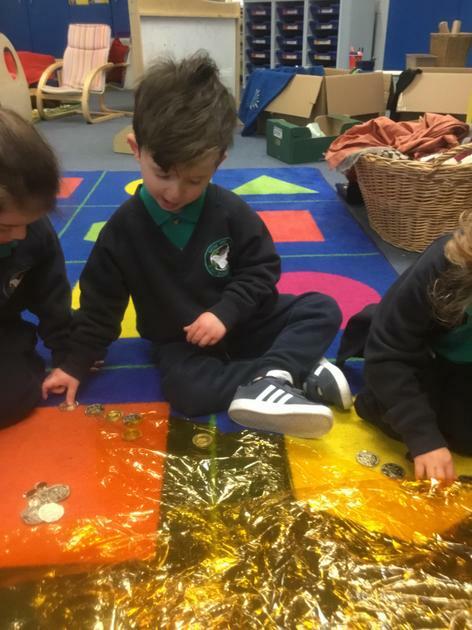 As a class we checked to see if the bears had the same amount. 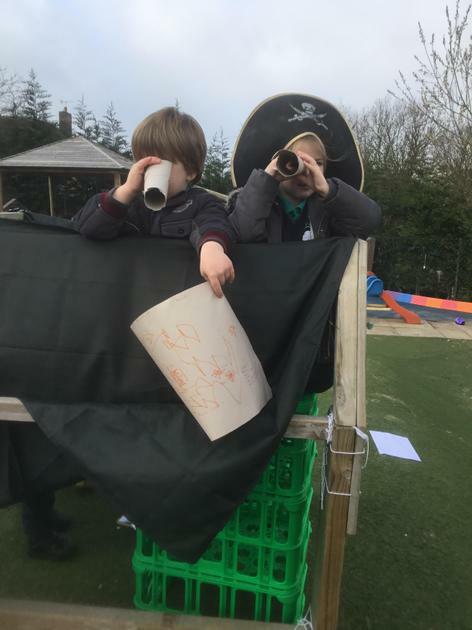 This week, the children have continued learning and engaging in lots of activities to do with Pirates. 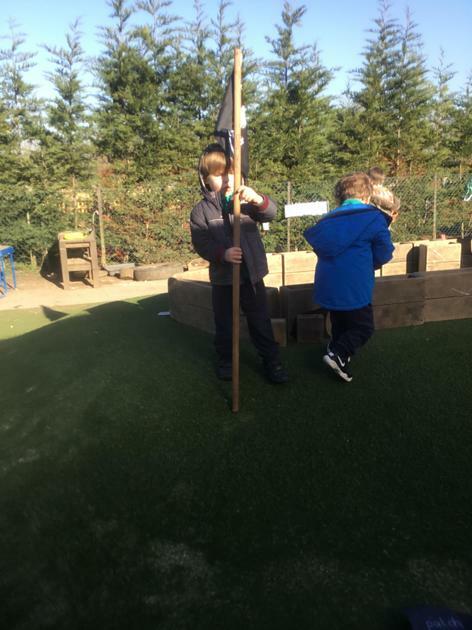 They have used the outdoor space and climbing equipment to develop their core strength and balancing. They particularly enjoyed taking turns to climb across the long beam of wood. Some children were measuring distance by racing cars down the mount. They challenged themselves by using the timer to see how long it would take for the cars to reach the bottom. In Phonics, the children learnt about different voice sounds. We read the story 'Peace at Last' which is all about a bear who can't get to sleep because of all the sounds around him. The children retold the story with puppets and were able to create the different voice sounds. Some children drew pictures of the characters from the story using the mini puppets for support. 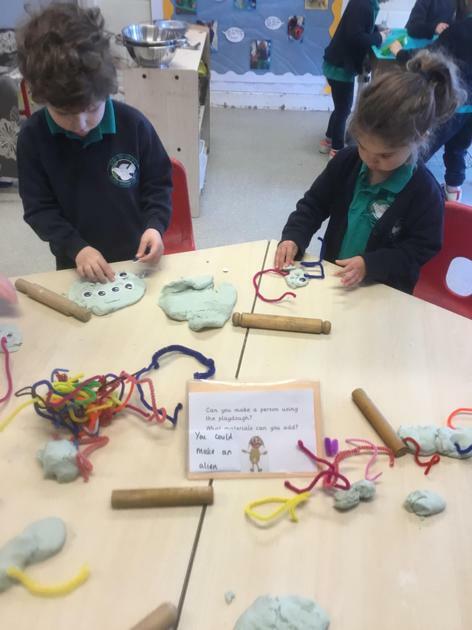 The Nursery favourite this week was making Pirate playdough! the children were able to measure half and full cups of ingredients to create the correct conistency for playdough. 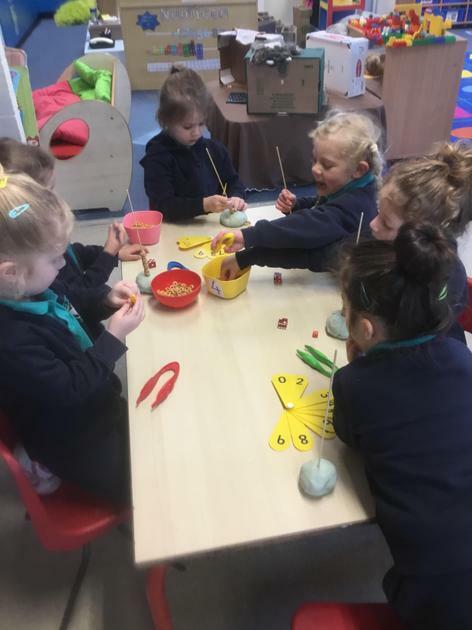 They developed their fine motor skills by taking treasure out of the playdough with tweezers. 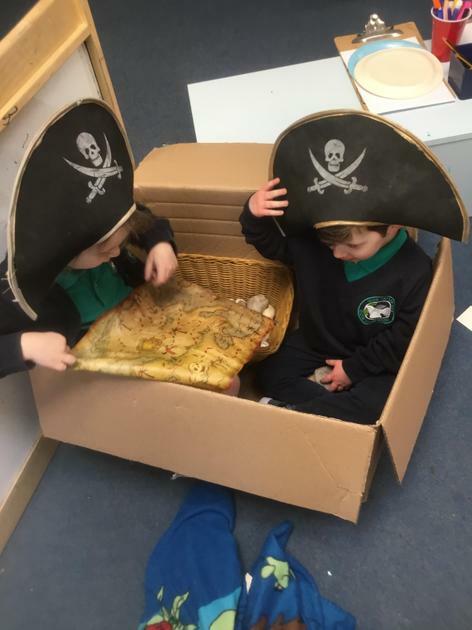 The children have been very excited by our new topic Pirates. 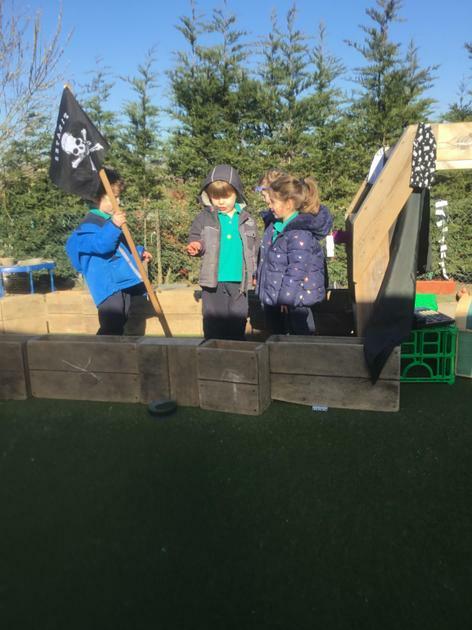 They used the outdoor space to climb aboard the pirate ship, dig for buried treasure in the sandpit and walk the plank (across the tyres). 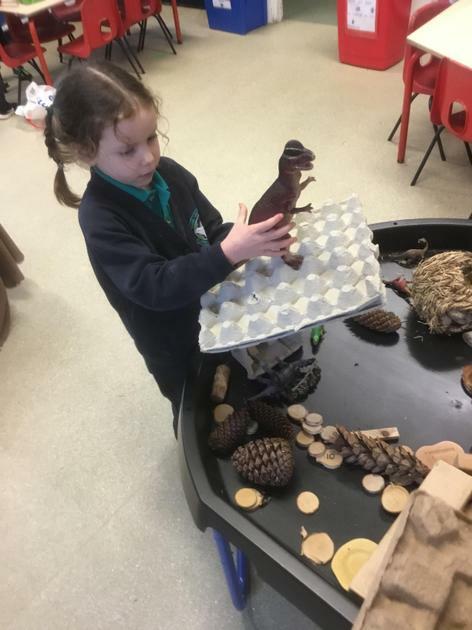 Inside the classroom, the children enjoyed exploring our small world sensory tuff tray. 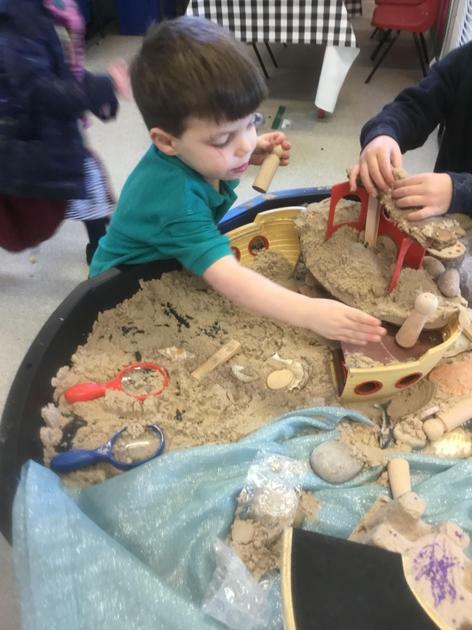 Some children challenged themselves to find all of the buried treasure and other children built stories using the wooden pegs, natural materials and the pirate ship. This small world tray inspired some children to create their own treasure maps using different materials. The children are now able to select sand and water resources independently. For example, In the water tray the children used nets to catch fish. Some children were able to count how many fish they collected and use language of more and less. 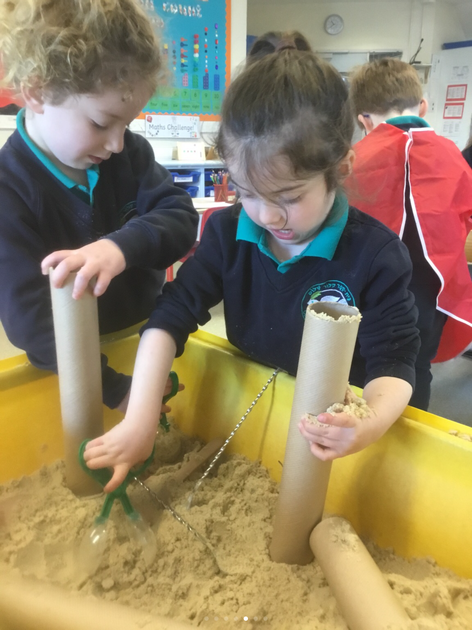 The children were able to select different size spoons for the sand tray. They used their problem solving skills to fill up long cardboard tubes. Some children tested their ideas by using different sized spoons to fill up and empty the tubes. 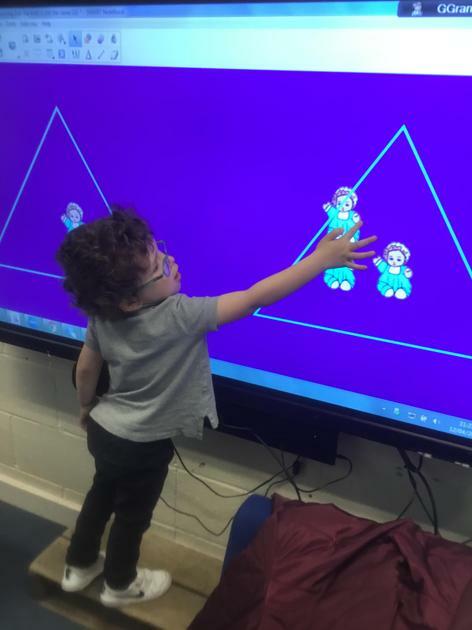 Here are some photos of the their learning. 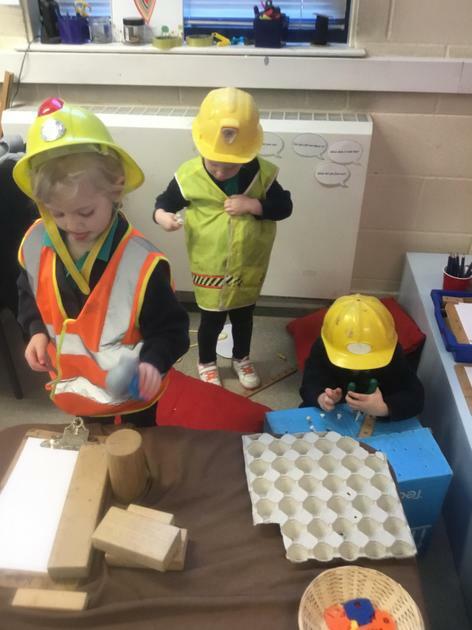 The Nursery favourite this week was a new builders area. 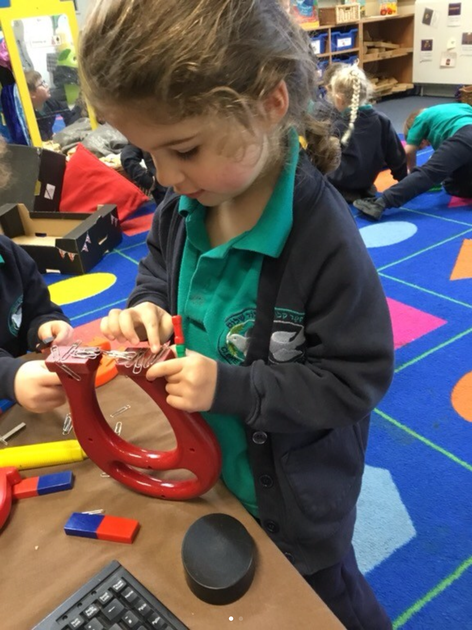 The children were able to use one handed tools safely. They selected wooden pieces and used various construction tools to carefully hammer golf tees into boxes. This tactile activity helps to develop hand eye coordination and dexterity. The children learnt how to work together and were highly engaged in the process. The children practiced the use of positional language in their play. They were able to position dinosaurs in different directions. 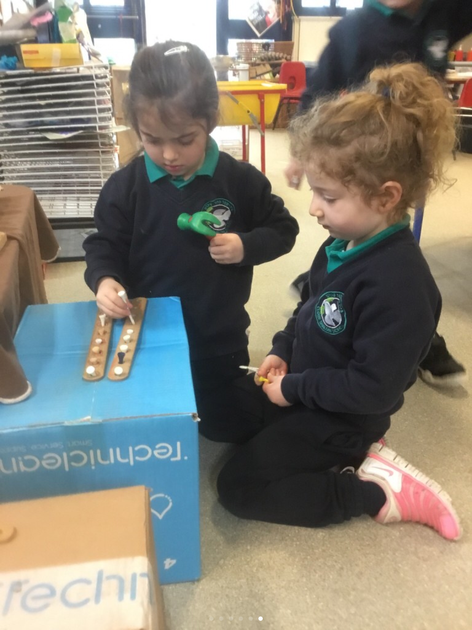 One child said, “My dinosaur is hiding under the box,” and another said, “It’s on top, look.” The children were also able to follow instruction using a ‘positional language dice’. For example, an instruction on the dice was, ‘put the object next to the box’ and the children followed. This concept was also applied in the outdoor space through building obstacles courses together. 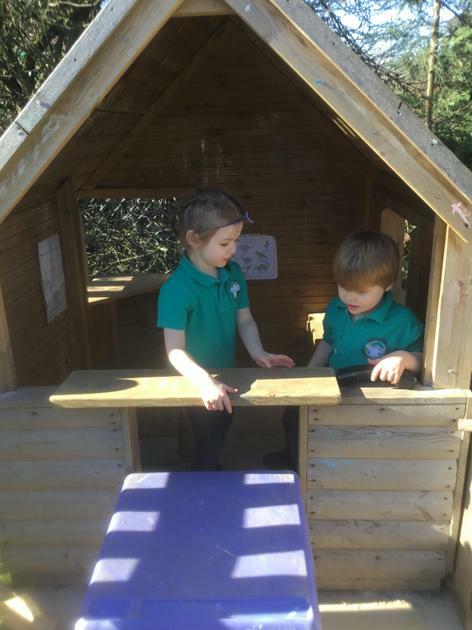 The children have continued to develop their language and communication skills in the Deconstructed Role Play area. 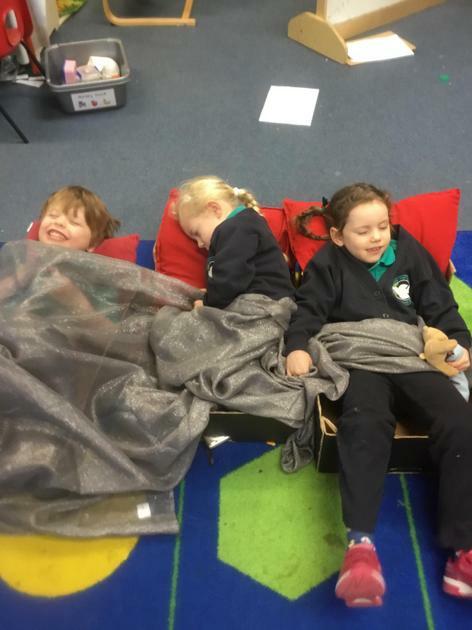 They used the boxes to create beds for each other as well as make delivery boxes. 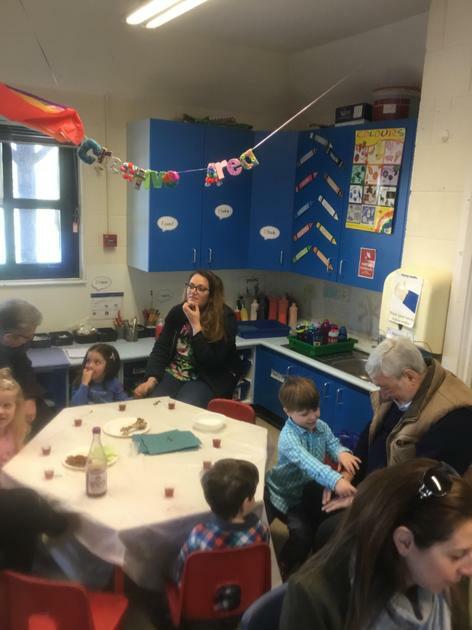 The children developed their social interactions by setting up picnic tables and celebrating birthday parties. Lexie- "I use my tablet to play games on it and have to tell my mummy and daddy." Sophia- "Can I play on my phone mummy? We play on YouTube. I ask my mummy." Zoe- "I ask my Mummy if I can play on the phone, she says yes." Jessica- "You ask, can you go on the internet and they say yes. I use my iPad." Sam- "I ask my mummy and daddy to go on the iPad. Mummy said I can't go on for a long time!" 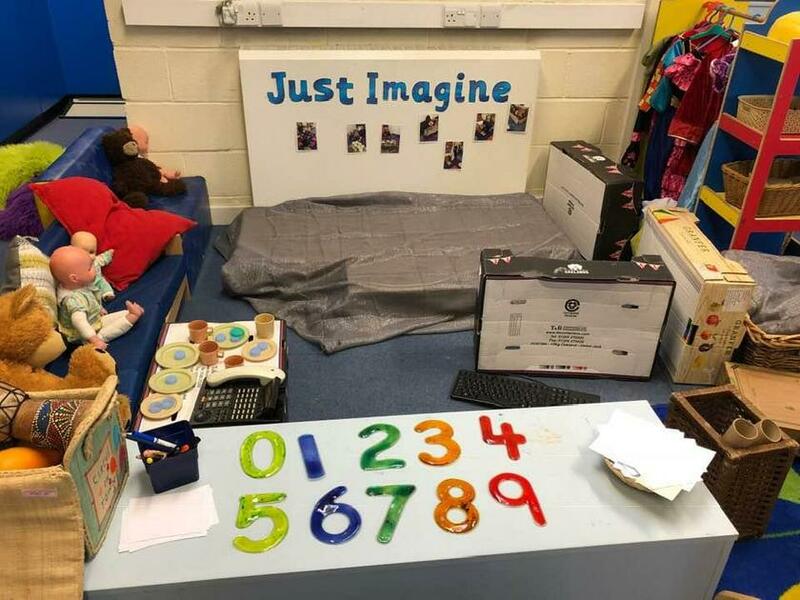 Some of the children also used their Deconstructed Role Play area to explore some of what they had learnt, as well as re-enact their own familiar experiences using electronic devices. 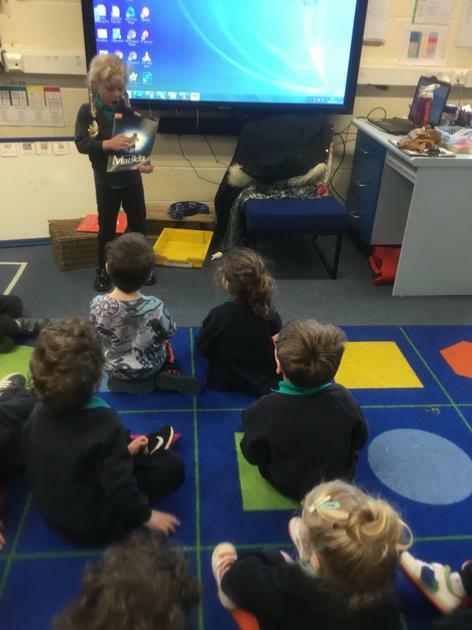 The children used their imagination with the boxes and turned them into electronic devices including computers and iPads. 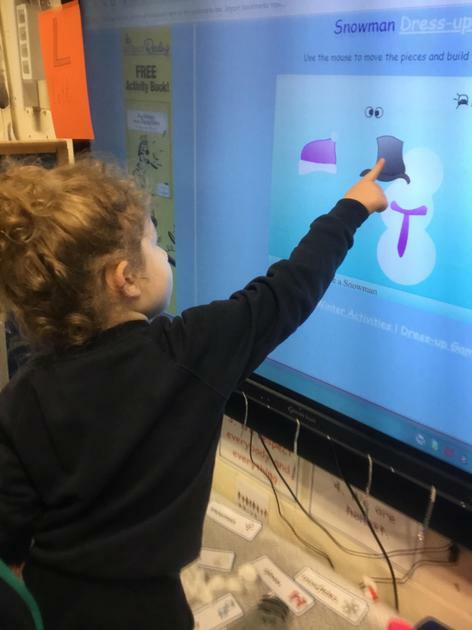 The children continue to strengthen their hand muscles, which will develop their fine motor control and prepare them for writing. 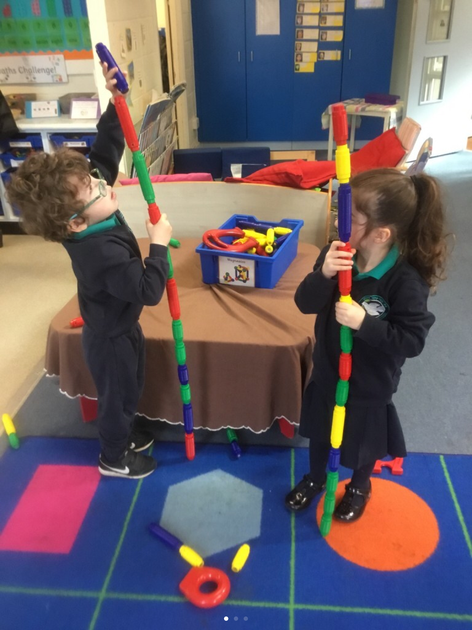 They have been threading beads onto a stick and some children challenged themselves to make a repeated pattern. Nursery have been introduced to a range of exciting learning opportunities this week! They are extremely lucky to have brand new sand and water resources. 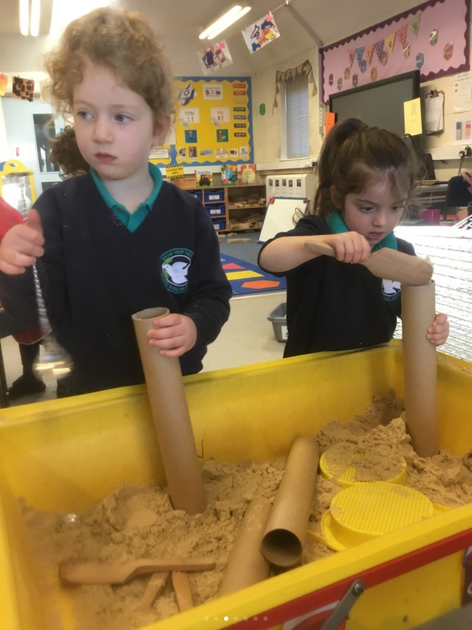 The children have been using different sized scoops, spoons and containers in the sand tray. 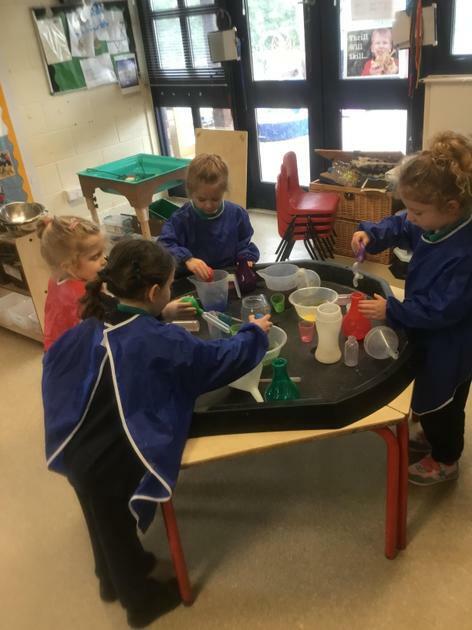 Some children have explored capacity by working together to fill the different sized containers. Other children were able to extend their play by estimating how many scoops it would take to fill up the different sized containers. The children are accessing the Deconstructed Role Play independently. This week the children decided to build houses with the boxes and set up picnic tables. They even used the boxes to create sledges in the snow! 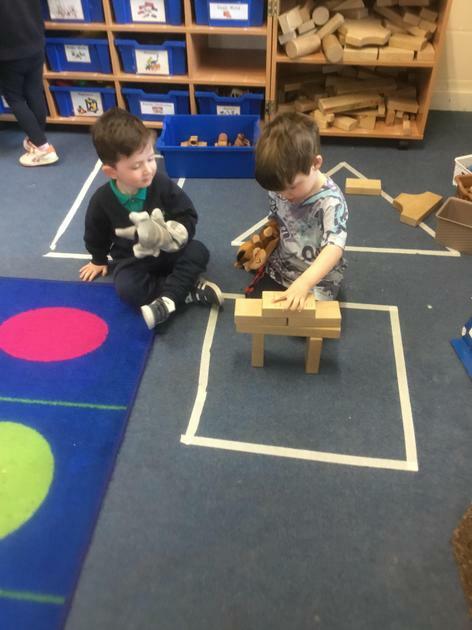 The children are developing their language and communication skills through building on their play ideas with each other. 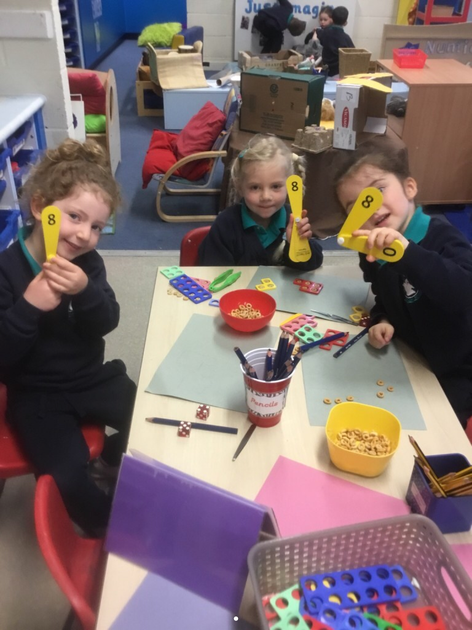 Nursery were introduced to an interactive Numicon number line. We practiced counting to 10 and matching numeral with quantity. This will be out in the environment for the children to access independently next week. Finally, Nursery were lucky to have Ben from Watford Football Club come to visit us. The children learnt about different roles in football and practiced their ball skills in partners. 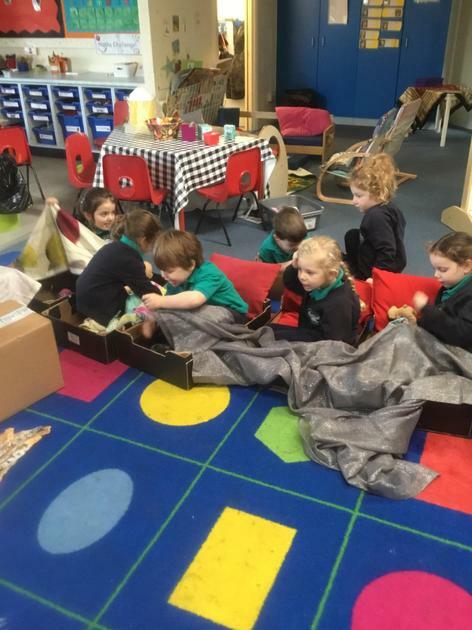 Another exciting week in Nursery! 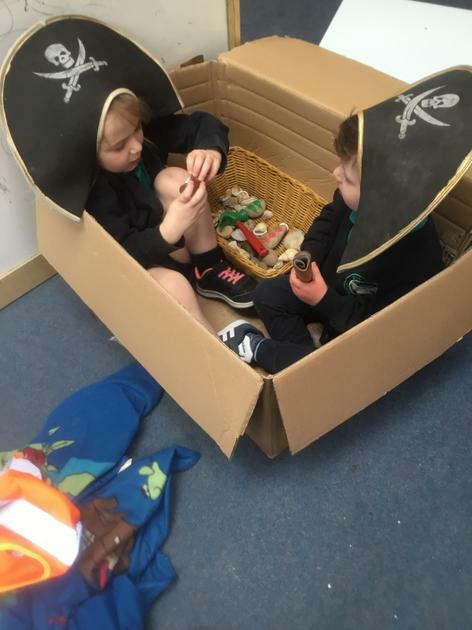 One of our Nursery favourites this week was using our new Deconstructed Role Play to go on adventures! Our story of the week was 'Whatever Next' which is all about a bear who flies to space in a rocket! Some of the children used boxes and other resources to fly to space! 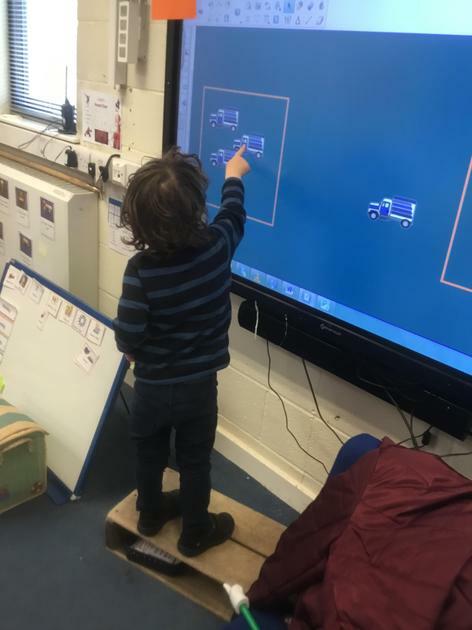 It is fantastic that the children are able to create their own play ideas through more open-ended resources. 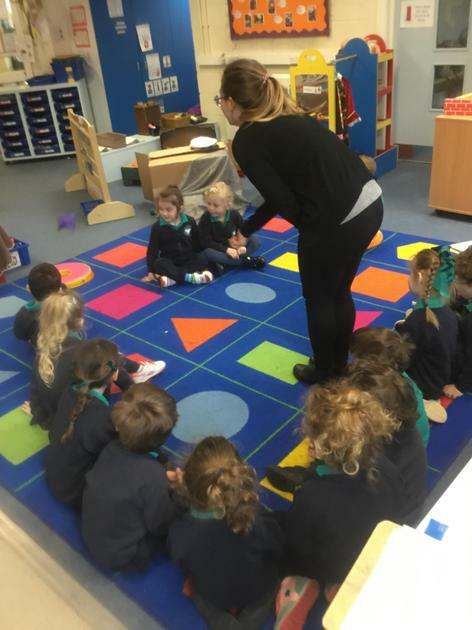 Another Nursery favourite was learning the song 'Ten Green Bottles'. This helped the children practice counting to 10 and challenged them to to count backwards from 10. 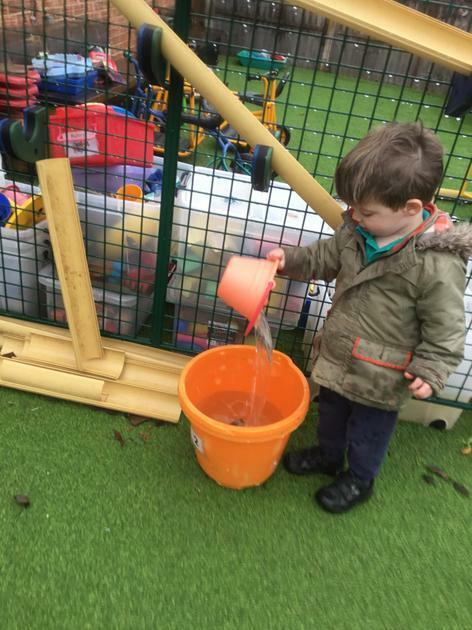 The children enjoyed practicing this song in the environment by creating 'Ten Green Bottles' in the water tray. Finally, we continued learning about people who help us. This week we learnt about Policemen and Policewomen and how they keep us safe. Here are some of our highlights! 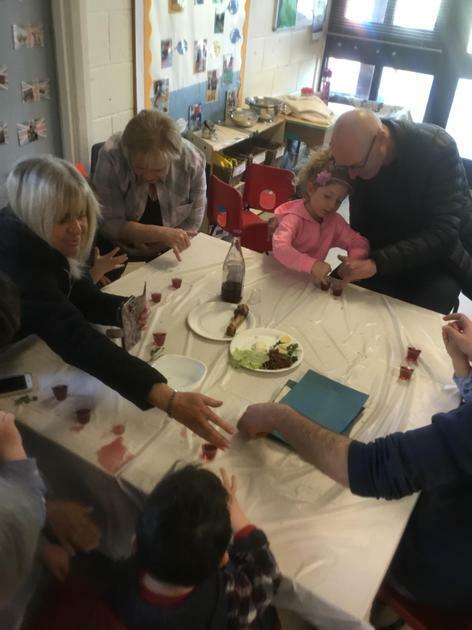 The children enjoyed their Tu'bishvat party this week. 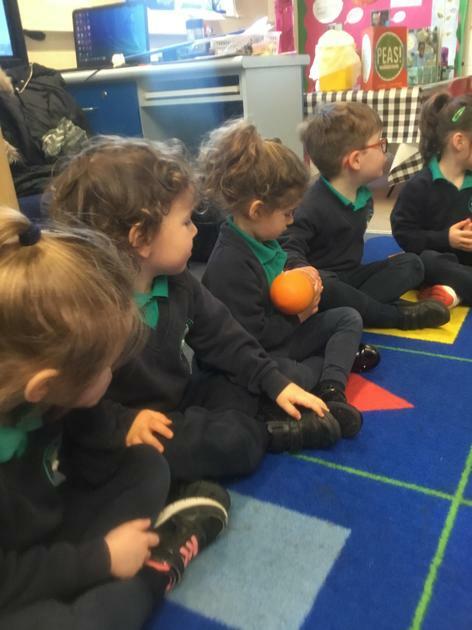 They had the opportunity to try lots of different fruit and sing some Tu'bishvat songs. The children have been practicing and performing these songs in the Nursery. 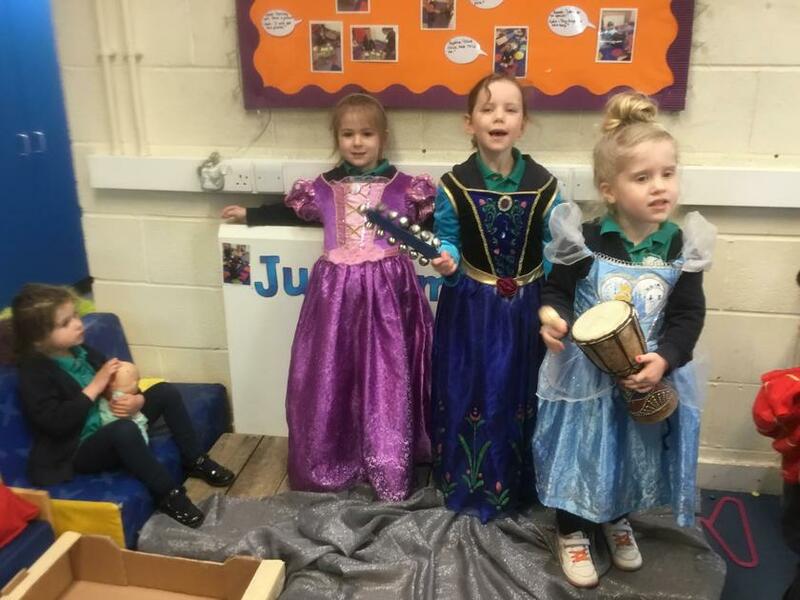 We have had a lot of fun this week in Nursery! We have continued learning about people who help us, focusing on firefighters. The children became real life firefighters in the role play when they created different play scenarios. Our home corner set on fire! Don’t you fear, our team of Nursery had all the skills and knowledge to put it out! The children are beginning to use more open-ended resources as props to support their play. For example, in this scenario they used kitchen role tubes as hose pipes. We will be continuing to develop this skill. 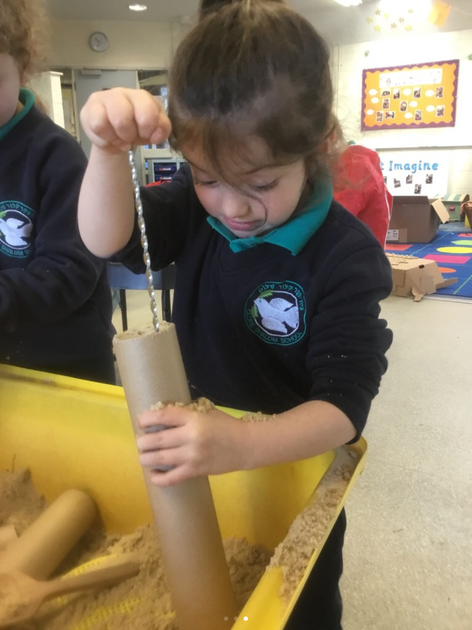 If you have any resources including boxes of different sizes or kitchen role tubes, could you please bring them in to Nursery. 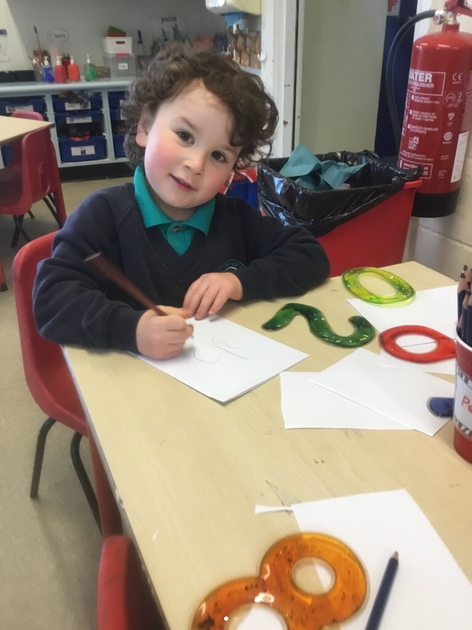 Nursery have been learning to select and use a range of different materials for their Art pictures. 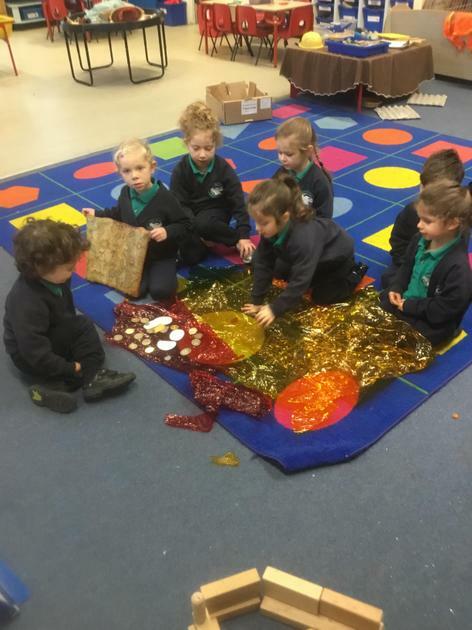 Some children enjoyed selecting different materials to create their own fire pictures and were proud of their designs. The children were introduced to a new Mathematical concept: matching numeral with quantity. With support, they were able to count how many people there were in a set and find the matching number. 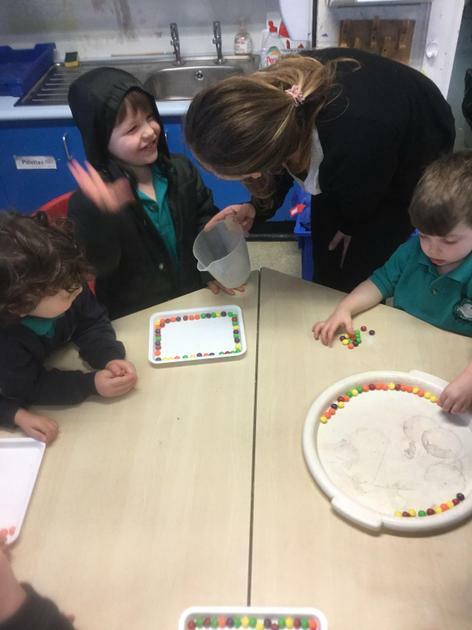 Some children also enjoyed practicing this concept independently by transferring the correct number of beads into numbered pots. 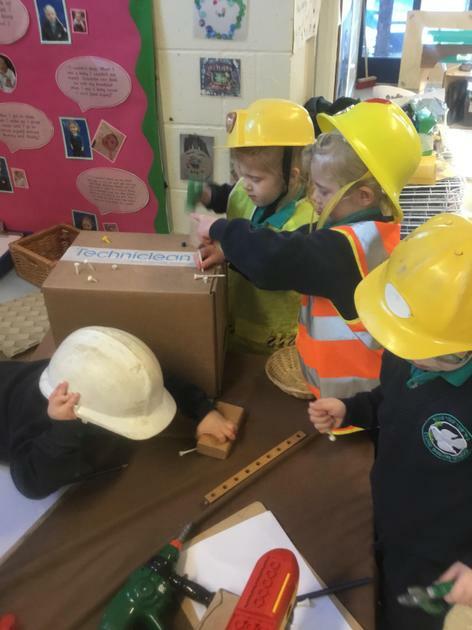 The Nursery favourite this week was introducing the children to the ‘Mystery box’. 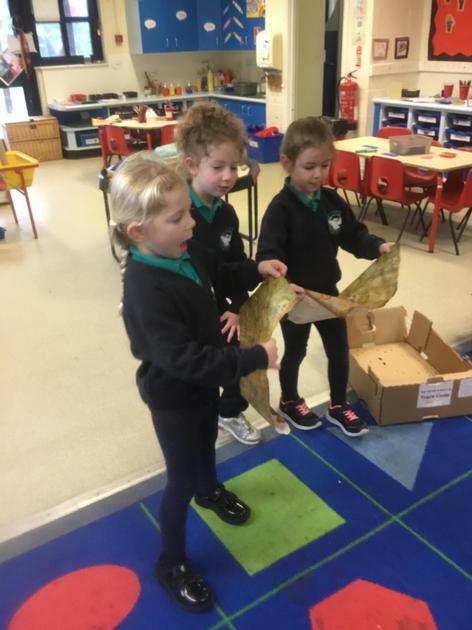 In our Phonics session the children learnt the ‘Mystery box’ song and were excited to find out what was hiding in the box. The children are beginning to show awareness of alliteration by recognising some objects that begin with the same sound. To practice this new skill, you could play games such as ‘Eye Spy’. I wonder what next week will bring! Hello, we have had a very exciting week in Nursery! We have started learning all about people who help us. This week, we learnt about doctors and nurses. 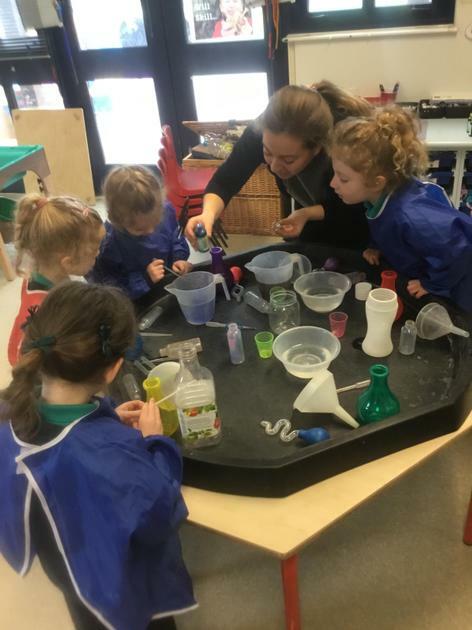 The children used their fine motor skills to make medicine for the babies, using small pipettes and syringes in the water tray. They were beginning to measure how much water is needed to fill up different sized containers. Some children learnt how to measure ingredients by making their own playdough. They were introduced to measuring half and full cups of ingredients. 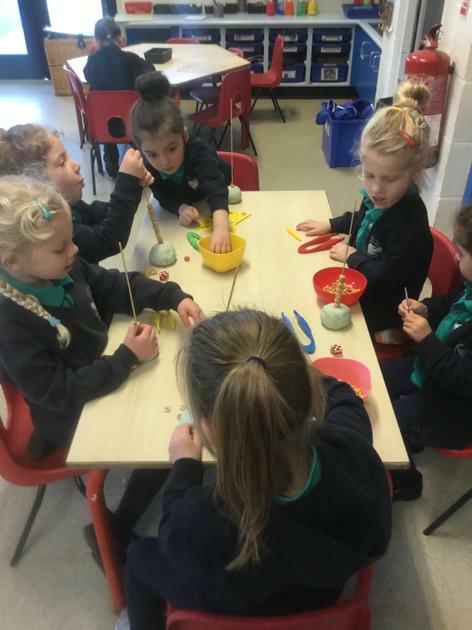 The children worked together to mix the ingredients and to discover the right consistency for playdough. One of the Nursery favourites this week, was our pasta tuff tray. The children continued to practise counting to 10, by counting the pasta pieces. 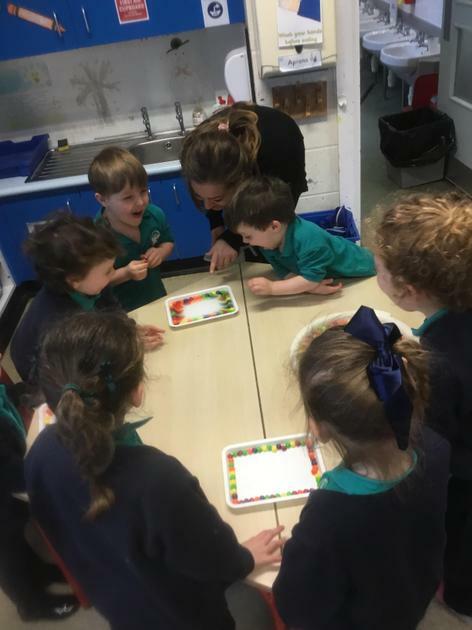 Some children enjoyed sorting the pasta by colour using the tweezers to challenge themselves. We enjoyed learning lots of new songs and rhymes including ‘Miss Polly had a Dolly.’ In Phonics, the children have been practicing their ‘silly soup’ activity. The class, with some support can now find two objects that rhyme. When they find two objects that rhyme, we use our ‘rhyming hands’ and say for example, ‘can and hat they rhyme’. I look forward to more exciting learning next week! Hello, my name is Miss Grant. This is my first year at Clore Shalom and I am excited to be joining the team as the Nursery teacher. I had a great day with the children, we played lots of different games to get to know each other. The children particularly enjoyed learning new songs and exploring rhythm and rhyme through different phonic games. I am looking forward to working with your child and creating lots of exciting learning opportunities. 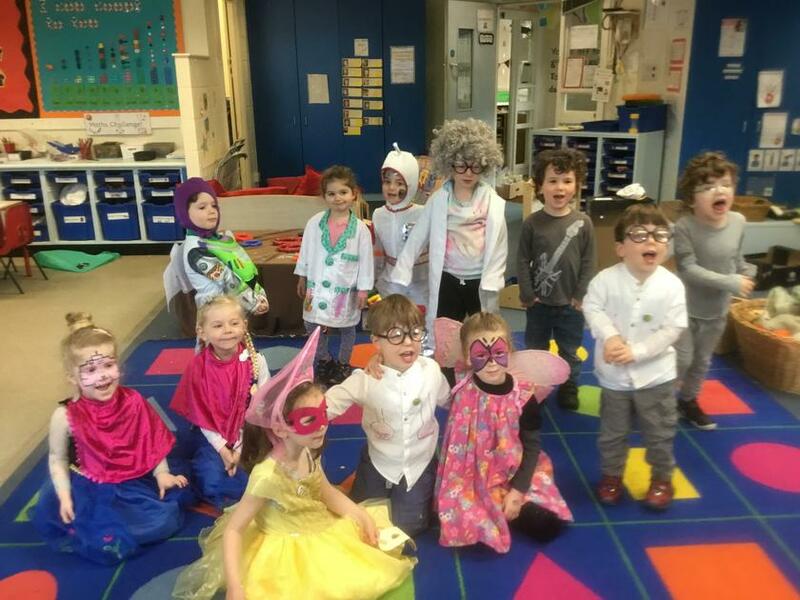 We have had so much fun this week in Nursery! 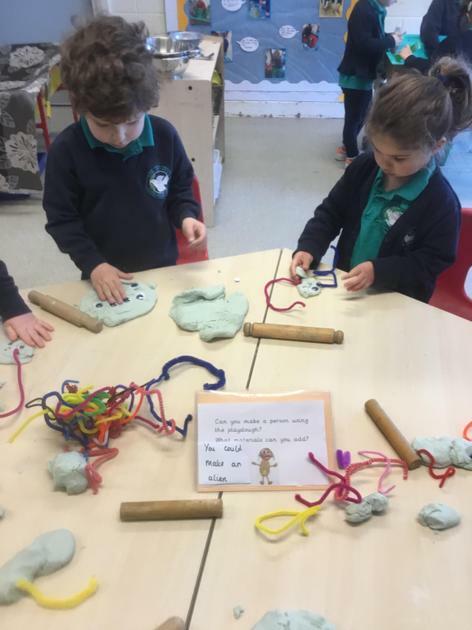 We started the week by recapping The Gingerbread Man and making some ginger scented play dough. We then made our own gingerbread men and took it in turns to add the ingredients and mix them together. We cut out our little men and put some raisins on them to decorate. On Tuesday our gingerbread men jumped out of the oven and ran away and we have spent the whole week looking for them. 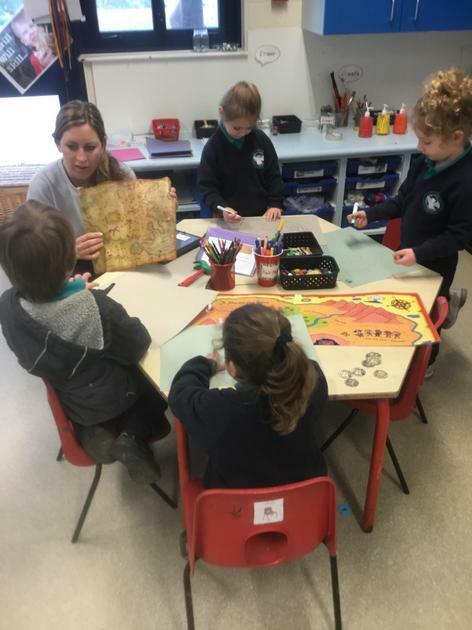 We made a wanted posted, created maps and went on a hunt round the whole school. Finally, after a week of searching we found them and got to eat them! In Maths we focused on 2D shapes. We used circles to make snowmen and squares and triangles to make houses. We also had a drama workshop based on The Billy Goats Gruff which the children thoroughly enjoyed. 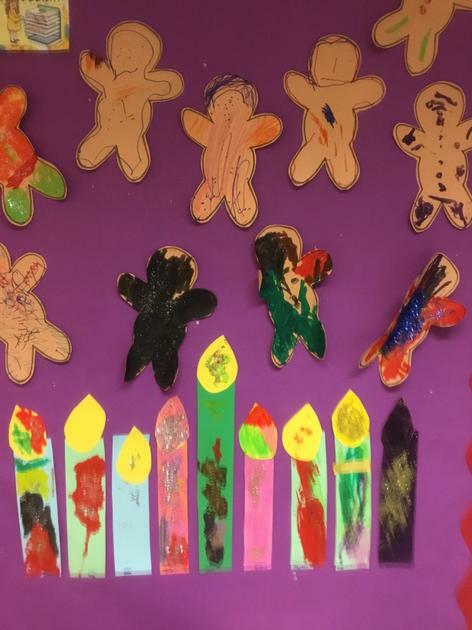 This week we have continued learning about Chanukah and worked together to create candles to make a chanukiah (see picture below). In Literacy we started our new story “The Gingerbread Man”. During Maths we looked at shape and spoke about the shapes we could see in the classroom. 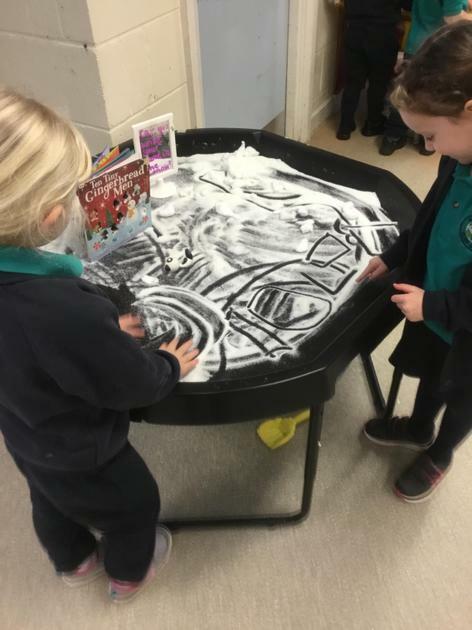 Our tuff tray was full of ‘snow’ this week and the children practised making shapes in the snow. 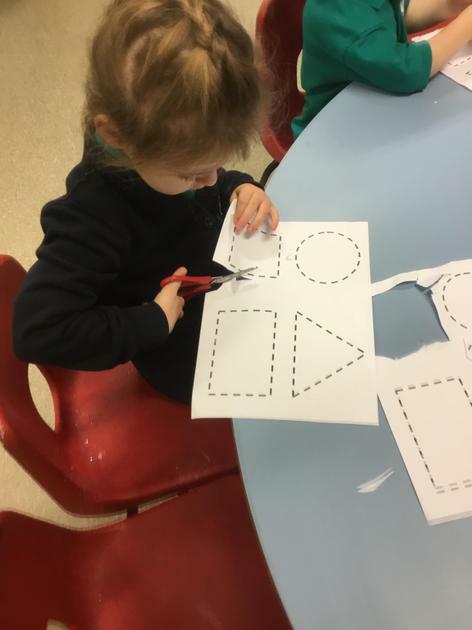 We also spent lots of time practising our cutting skills! 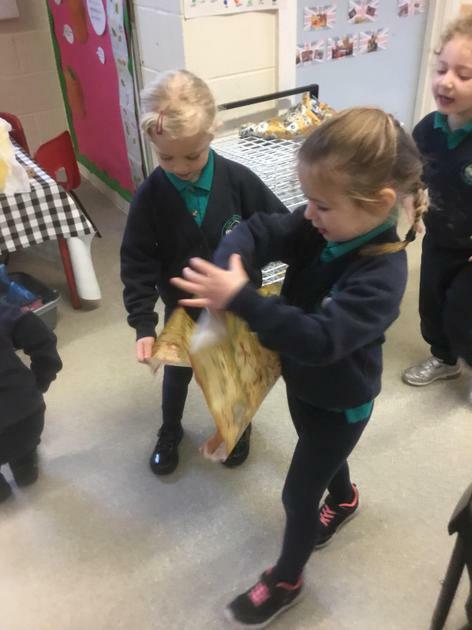 We have continued learning about ‘Goldilocks and The Three Bears’. This week we have focused on the order of the story and what happened next. The children have had the opportunity to retell the story using finger puppets and props in the tuff tray. Next week we will begin ‘The Gingerbread Man’. 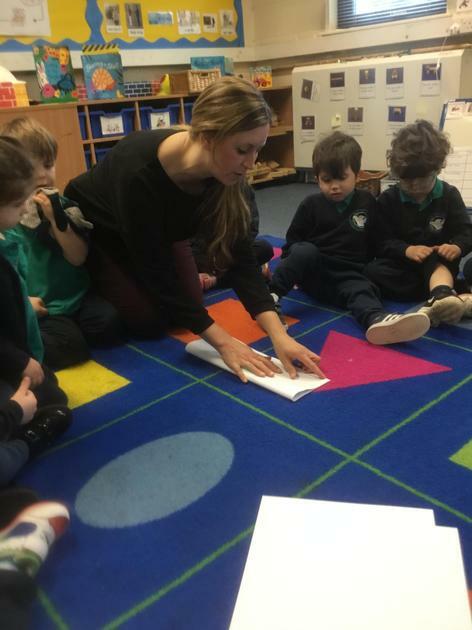 In Maths we learnt about different positions and learnt ‘positional language’ e.g on, under, next to. 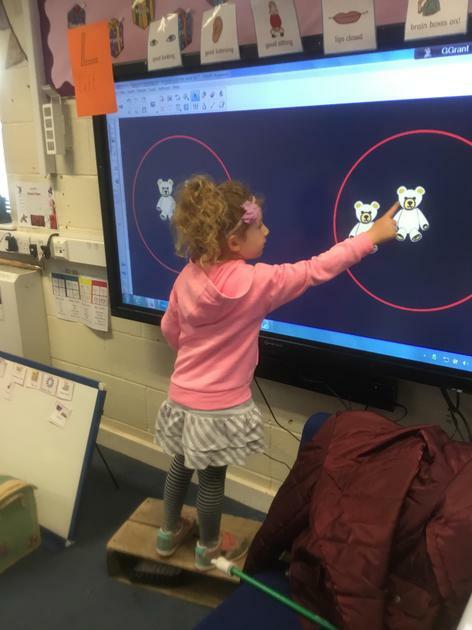 We used Daddy Bear and looked at where he was sitting in relation to his chair! The children loved listening to the song about the position of the monkey (link below). 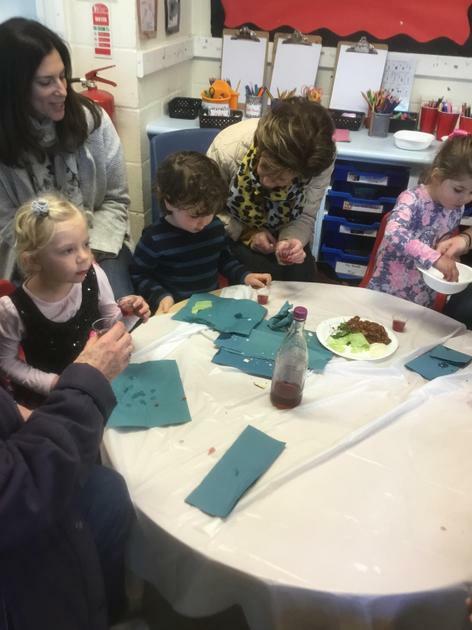 On Friday we had Chanukah Learning Day and the children made some lovely chanukiahs out of clay. We will decorate these next week. 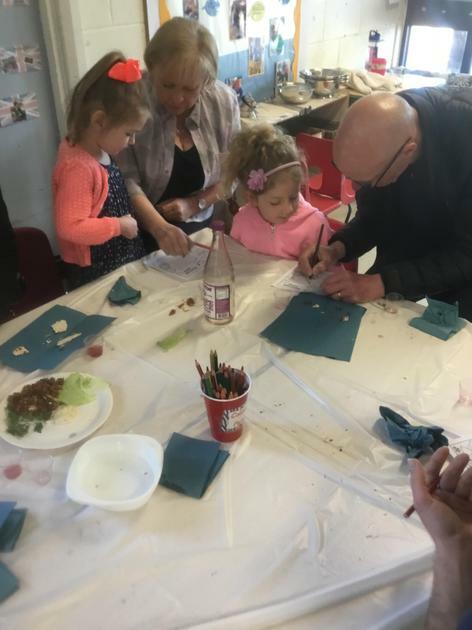 There was lots of singing and craft activities for the children to partake in too. This week we have had lots of fun continuing learning about “Goldilocks and the Three Bears”. 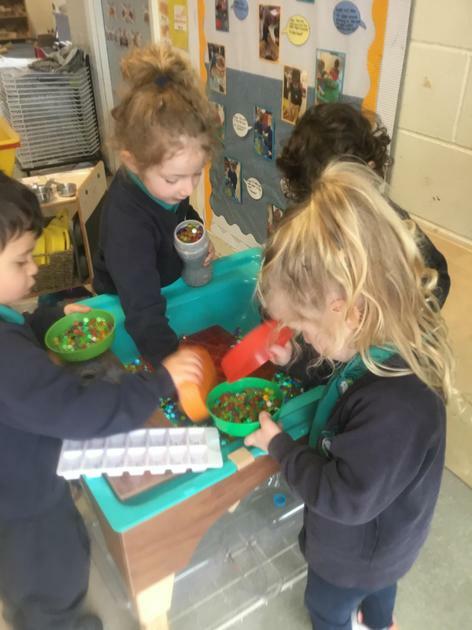 The children have been playing with porridge in our tuff tray and have been filling and emptying lots of different containers. We also made duvets for the bear’s beds using different soft materials.
. They have really enjoyed this activity. In our Literacy lesson the children told the story using a story map. We will continue doing this next week. We discussed the setting the story took place in and the children drew their own cottage in the woods. 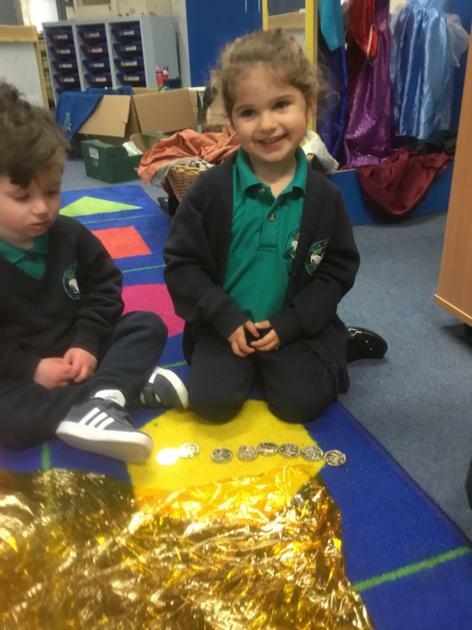 In Maths this we looked at big and small objects and sorted them into different piles. Next week we will continue with “Goldilocks and the Three Bears”. We started this week by talking about Remembrance Day. We spoke about soldiers and the children’s experience of Remembrance Sunday. The children created a big poppy together by sticking red tissue paper onto a picture of a poppy. This week we also started our topic on ‘Traditonal Tales’. We read the story ‘Goldilocks and the Three Bears’ and had lots of opportunities to act out and recreate the story. The children enjoyed role playing in our ‘Bear Cottage’ and used small puppets to tell the story. We made some bear masks in our creative area using a range of art materials! In Maths we worked on our number recognition by matching sets of bears to numbers. Next week we we will continue with ‘Goldilocks and the Three Bears’ and will retell the story using a story map! Look out on Tapestry for a video of this! We have had lots of fun this week in Nursey! We spoke about the fireworks we had seen over the weekend and created lots of fireworks pictures. We made rockets and used our handprints to make the flames of our bonfire picture (picture below). In our tuff tray we made salt dough and then added sequins, glitter and stars to create fireworks! Please email or add on Tapestry any pictures you have of the children enjoying fireworks night. 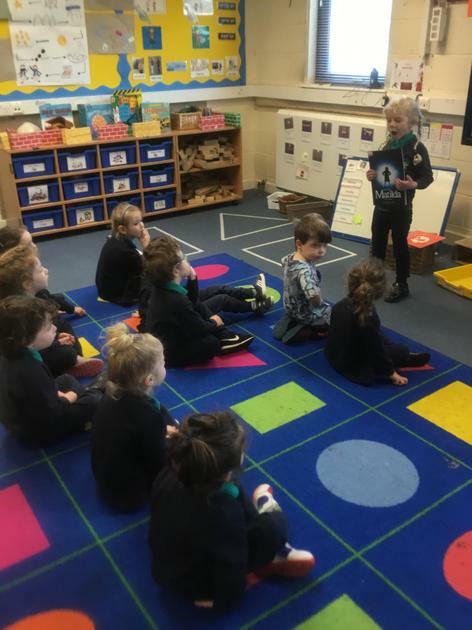 We have been partaking in ‘Antibullying Week’ and joined the rest of the school in a house activity where we were able to create a video with the rest of the children in our house! We have spoken about the word ‘respect’ and also what it means to be a kind friend. We created a friendship promise and signed it using a finger print. All of the ideas on the promise came from the children. This is displayed on the wall in the classroom. At the end of the week we learnt about Diwali and learnt a song about Diwali lights! This week we have learnt all about Africa! The children have enjoyed lessons on African life and we have watched and read stories about different African children. We have listened to African music and learnt some African dance. We looked at different Kente cloth and created some of our own! At the end of the week we were fortunate to attend an African drumming workshop run by Venavi Drums (07941055122).The children wore traditional African tunics and had the opportunity to play some drums. 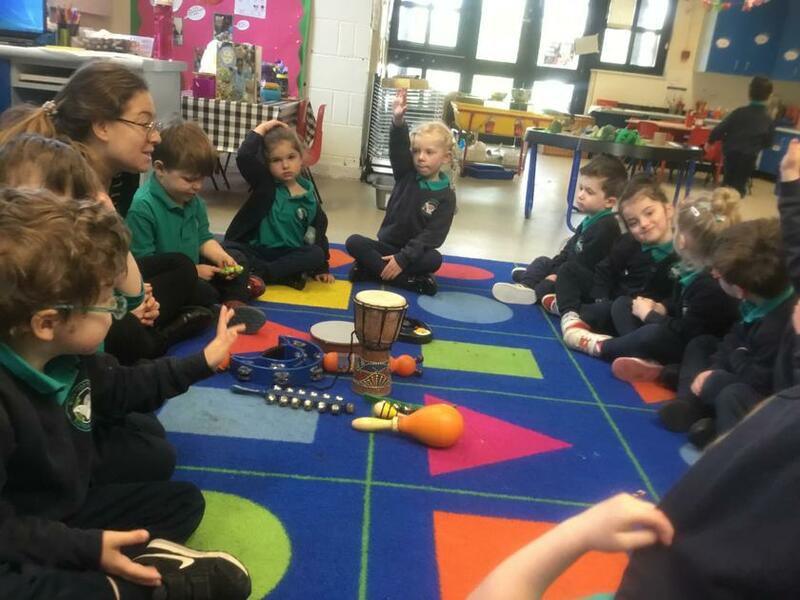 They loved the workshop and after recreated the rhythms they had learnt using different instruments! Wishing you a lovely break! We have continued learning about autumn this week and now have an autum interest and investigation table in our classroom. 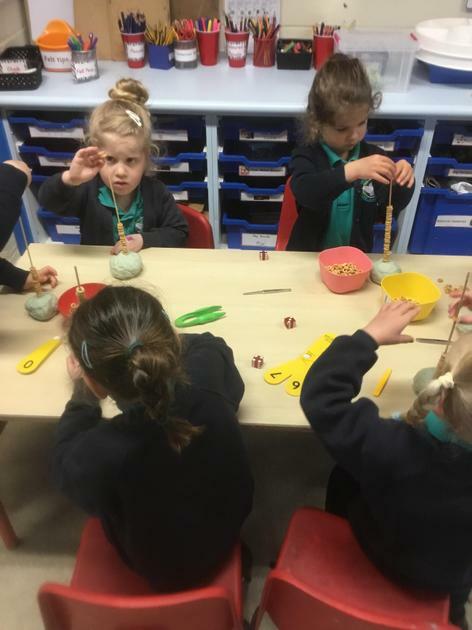 The children enjoyed looking at the different objects and bringing in conkers to add to it! Our story this week was ‘Brown Bear, Brown Bear, What Do You See?’ by Bill Martin Jnr and Eric Carle. By the end of the week the children were able to read the story independently using a story map (picture below)! 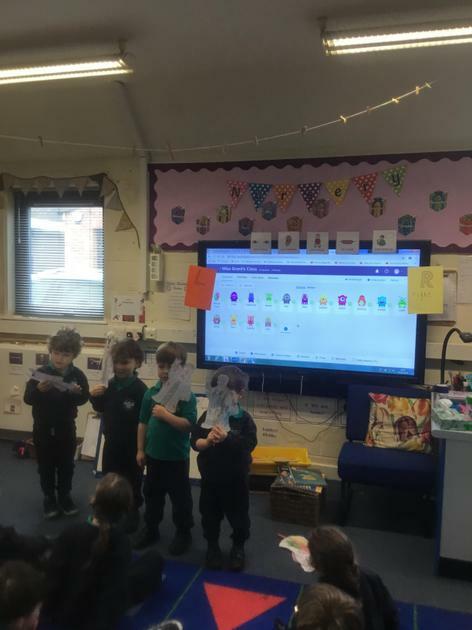 We explored all the different colours of the animals and used puppets to act the story out! 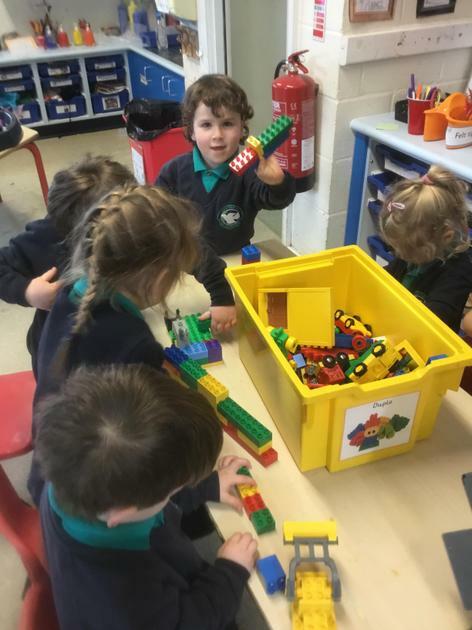 Lots of the children enjoyed playing with the Lego this week so there will be lots of opportunities to do this next week. 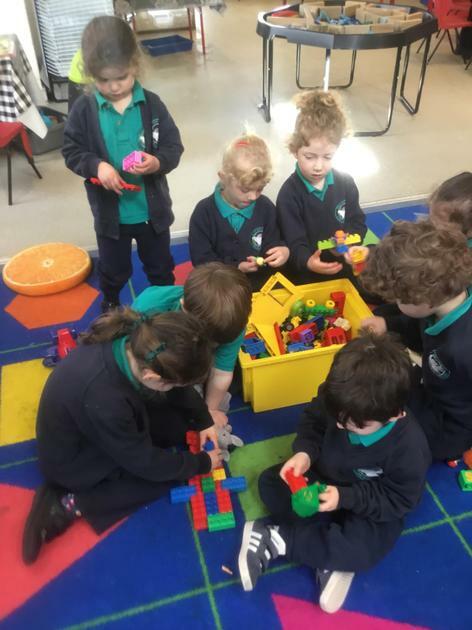 In maths we have continued to use numicon to help us count. We have also been focusing on counting accurately to 10. 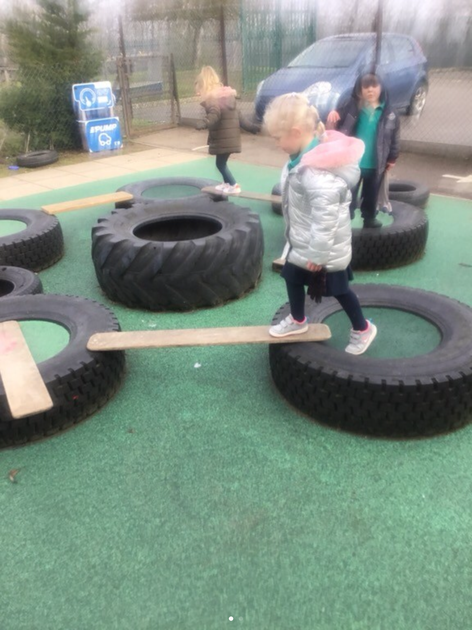 When outside the children have been focusing on their balancing. We set up challenges where they had to balance on the pods and walk across them independently! This week we started out topic on autumn! We went on a walk around the field to look at the trees and collect some leaves. When we got back to the classroom we discussed what we had seen and did some leaf rubbing. We also learnt a song about autumn leaves so please ask your children to teach it to you! 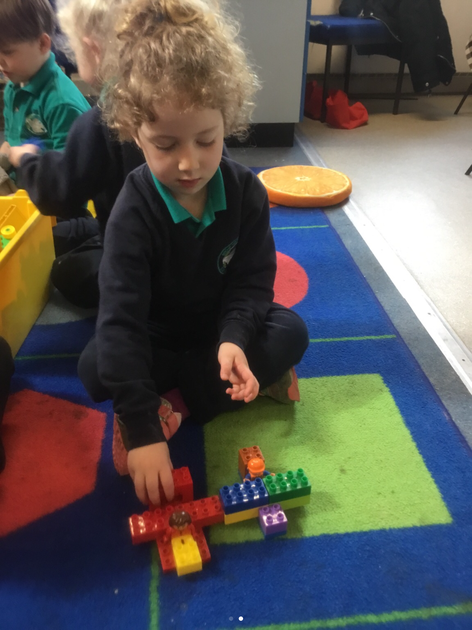 In maths we have been practising counting to ten and have learnt the different numicon pieces. We recognise each piece by counting how many holes it has! We have now opened the mud kitchen outside and lots of the children worked together to make some muddy cakes and soup! We have had a very busy week in Nursery! The children have continued to explore their senses and in the classroom we had a tuff tray full of different herbs! It was lots of fun smelling them and looking at them through magnifying glasses! As we are learning about ourselves we made faces from salt dough and different objects such as buttons and pasta. 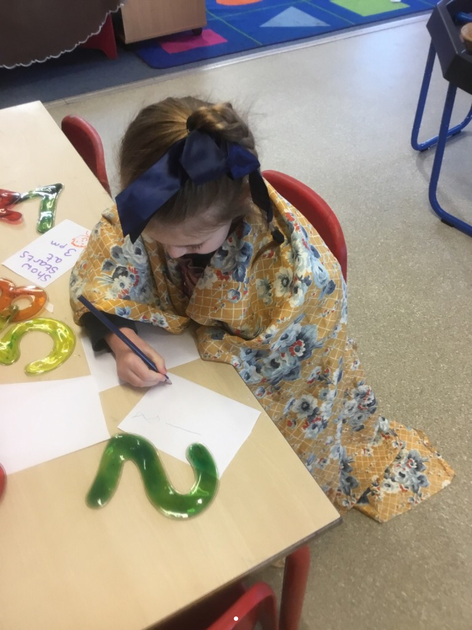 The children looked at their faces in mirrors to see what they needed to add. Our number of the week was 2! We looked at our faces and noticed we have 2 eyes, ears, nostrils, lips andeyebrows. We also realised we have 2 arms, hands, legs and feet! 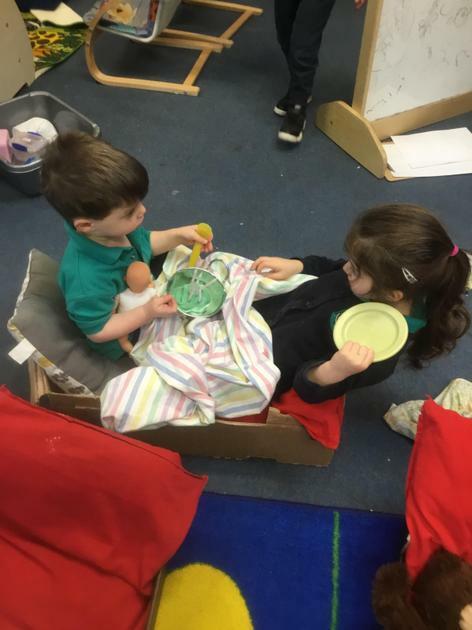 Next week we will be looking at our baby pictures and talking about what we did when we were babies and what we do now and how it is different. 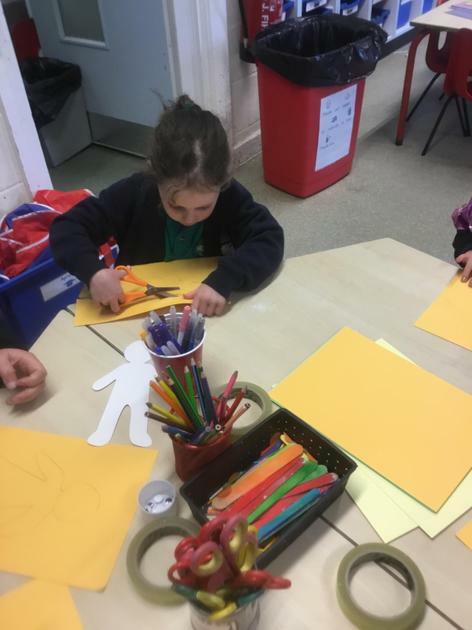 This week in Nursery the children have been focusing on our topic ‘All About Me’. We read a story which explored the different parts of our face and discussed our eyes. We looked at each other’s eyes and discussed what colours we could see! In maths we focused on our number of the week. This week it is the number ‘3’ as at the start of the week all the children in the class were 3! The children will be keeping their eyes open for any 3’s at home so please add some pictures on Tapestry and we can look at them together next week, next week our number of the week is ‘5’. We have had another exciting week at school. The children have continued getting to know each other and we have sung a song all about our names and saying hello. This week we have covered the school rules and what we need to do to keep safe in the classroom. 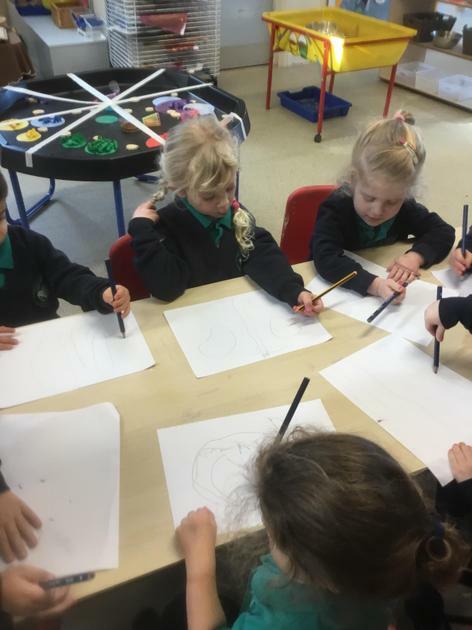 The children have continued to explore all the areas of our early years unit and have spent time mixing with the reception class. We have practised our counting and sung some number songs. The children have also created some beautiful pictures which they have been bringing home. I hope you have a wonderful weekend and we will see you on Monday! Settling into Nursery with our new friends! It was lovely to welcome all of the new children to Clore Shalom this week! We have had an exciting couple of days at school! 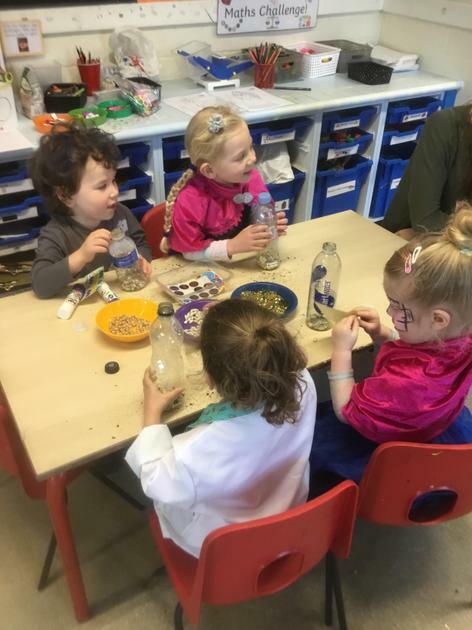 We explored the Nursery and Reception classrooms and spent lots of time outside where we played with sand and water. 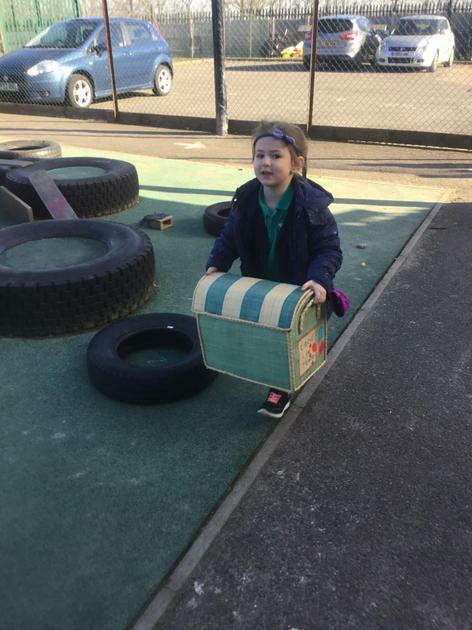 The children enjoyed climbing on the tyres and building using the wooden blocks. 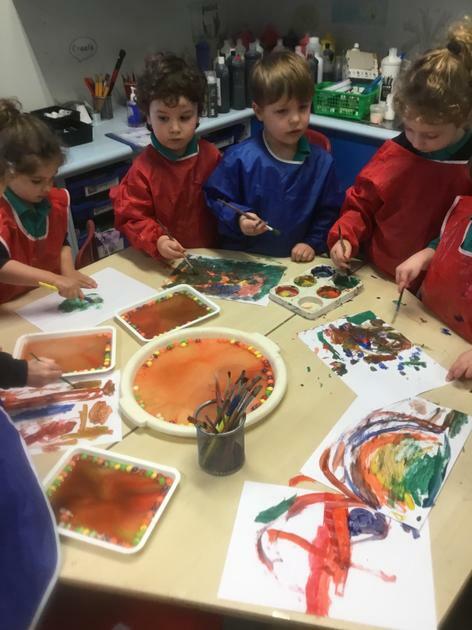 During our time in the classroom we used feathers, sequins and paint to create pictures. 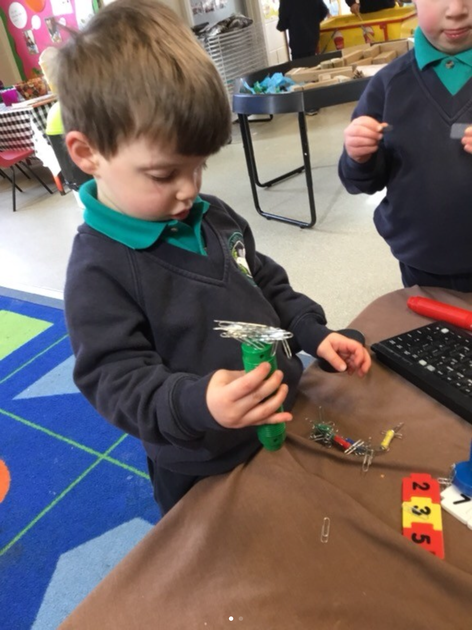 We played with lots of different toys and got to know the other children In our class! 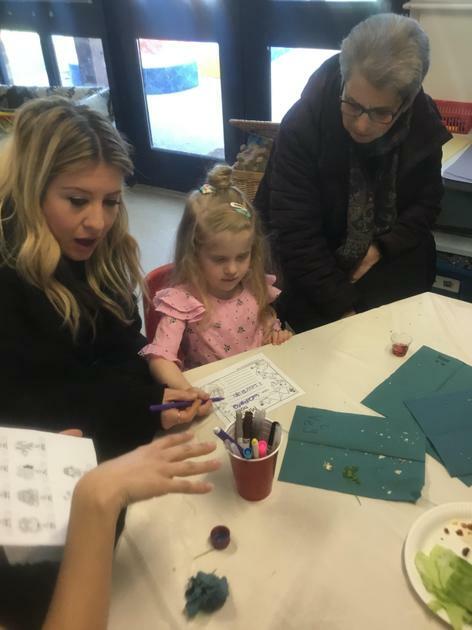 On Friday we spoke about Rosh Hashannah and made pictures using apples and some paint! 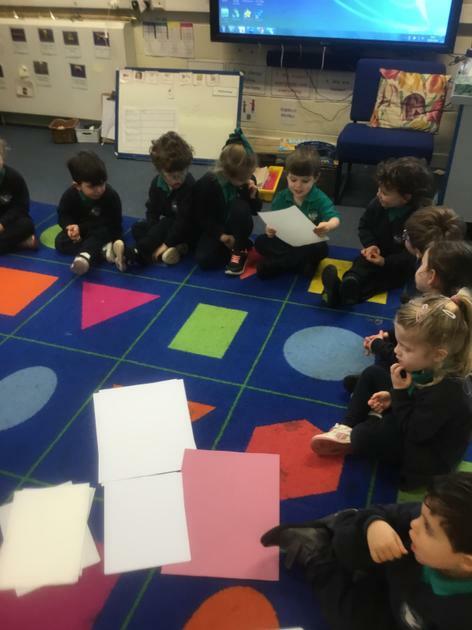 We joined Reception for our first Kabbalat Shabbat and sang lots of songs! Wishing you a lovely weekend and a Shana Tova!